Embodiments of the present invention provide methods for reducing expression of kallikrein (KLKB1) mRNA and protein in an animal. Such methods are useful to treat, prevent, or ameliorate thromboembolic conditions. The blood coagulation system responds to vascular injury with local production of a clot formed of fibrin mesh and activated platelets. While this process is essential for hemostasis, dysregulated coagulation can lead to blood vessel occlusion (thrombosis), precipitating life-threatening events such as myocardial infarction, stroke and venous thromboembolism. In the classical view of blood coagulation, thrombin generation and fibrin formation can be initiated by two distinct mechanisms referred to as the extrinsic and intrinsic pathways (Davie, E.W. et al. Science. 145:1310-1312, 1964; Macfarlane, R.G. Nature. 202:498-499, 1964). The extrinsic pathway involves binding of plasma factor VIIa (fVIIa) to extravascular tissue factor (TF) at a site of vessel injury (Mackman, N. Arterioscler Thromb Vasc Biol. 24:1015-1022, 2004). The first step in the intrinsic pathway requires the surface-dependent activation of plasma factor XII (fXII) to fXIIa in a process called contact activation (Gailani, D., et al. J. Thromb. Haemost. 5:1106-1112, 2007; Schmaier, A.H. et al. J. Thromb. Haemost. 5:2323-2329, 2007). Contact activation involves two other proteins, prekallikrein (PKK) and high molecular weight kininogen (HK). HK serves as a docking molecule for PKK on the contact surface. PKK is cleaved by fXIIa to form the protease α-kallikrein, which in turn cleaves fXII to generate additional fXIIa. Collectively, fXII, PKK, and HK comprise the plasma contact system. FXIIa generated by contact activation can activate factor XI (fXI) to fXIa, triggering a series of proteolytic cleavage events that culminates in thrombin generation and fibrin clot formation. The plasma kallikrein/kinin system that consists of the proteins factor XII, prekallikrein, and high molecular weight kininogen was first recognized as a surface-activated coagulation system arising when blood or plasma interacts with artificial surfaces (Sainz et al. Thromb. Haemost. 2007; 98:77-83). The kallikrein-kinin system is a component of the intrinsic pathway of blood coagulation along with factors XI, IX, and VIII. These proteins have subsequently been shown to have roles in fibrinolysis, thrombin-induced platelet activation, control of blood pressure, cell adhesion and angiogenesis (Schmaier et al. Curr. Opin. Hematol. 2000; 7:261-265). Plasma prekallikrein is the precursor of plasma kallikrein, which in turn liberates kinins from kininogens and also generates plasmin from plasminogen. Plasma prekallikrein is converted to plasma kallikrein by Factor 12a by the cleavage of an internal Arg-Ile peptide bond. Plasma prekallikrein, in turn, is the product of the KLKB1 gene (MacKenzie, J.A. et al. Appl. Physiol. Nutr. Metab. 35: 518-525, 2010). Plasma kallikrein works in association with Factors 11 and 12. Thrombosis is the pathological development of blood clots, and an embolism occurs when a blood clot migrates to another part of the body and interferes with organ function. Thromboembolism may cause conditions such as deep vein thrombosis, pulmonary embolism, myocardial infarction, and stroke. Significantly, thromboembolism is a major cause of morbidity affecting over 2 million Americans every year (Adcock et al. American Journal of Clinical Pathology. 1997; 108:434-49). While most cases of thrombosis are due to acquired extrinsic problems, for example, surgery, cancer, and immobility, some cases are due to a genetic predisposition, for example, antiphospholipid syndrome and the autosomal dominant condition, Factor V Leiden (Bertina RM et al. Nature 1994; 369:64-67). The most commonly used anticoagulants, warfarin, heparin, and low molecular weight heparin (LMWH) all possess significant drawbacks. Warfarin is typically used to treat patients suffering from atrial fibrillation. The drug interacts with vitamin K -dependent coagulation factors which include factors II, VII, IX, and X. Anticoagulant proteins C and S are also inhibited by warfarin. Drug therapy using warfarin is further complicated by the fact that warfarin interacts with other medications, including drugs used to treat atrial fibrillation, such as amiodarone. Because therapy with warfarin is difficult to predict, patients must be carefully monitored in order to detect any signs of anomalous bleeding. Heparin functions by activating antithrombin which inhibits both thrombin and factor X. (Bjork I, Lindahl U. Mol Cell Biochem. 1982 48: 161-182). Treatment with heparin may cause an immunological reaction that makes platelets aggregate within blood vessels that can lead to thrombosis. This side effect is known as heparin-induced thrombocytopenia (HIT) and requires patient monitoring. Prolonged treatment with heparin may also lead to osteoporosis. LMWH can also inhibit Factor II, but to a lesser degree than unfractioned heparin (UFH). LMWH has been implicated in the development of HIT. Thus, current approved anticoagulant agents lack predictability and specificity and, therefore, require careful patient monitoring to prevent adverse side effects, such as bleeding complications. There are currently no approved anticoagulants which target only the intrinsic or extrinsic pathway. The invention provides an antisense compound comprising a modified oligonucleotide, for use in preventing, treating or ameliorating a thromboembolic condition in an animal, wherein the modified oligonucleotide is at least 90% complementary to a KLKB 1 nucleic acid and wherein expression of KLKB 1 mRNA is reduced. Also disclosed herein are methods for modulating expression of kallikrein mRNA and protein. In certain embodiments of the disclosure, kallikrein specific inhibitors modulate kallikrein mRNA and protein expression or activity. In certain embodiments of the disclosure, kallikrein specific inhibitors are nucleic acids, proteins, or small molecules. In certain embodiments of the disclosure, modulation can occur in a cell or tissue. In certain embodiments of the disclosure, the cell or tissue is in an animal. In certain embodiments, the animal is a human. In certain embodiments, kallikrein mRNA levels are reduced. In certain embodiments of the disclosure, kallikrein protein levels are reduced. In certain embodiments of the disclosure, kallikrein mRNA and protein levels are reduced. Such reduction can occur in a time-dependent manner or in a dose-dependent manner. Methods useful for preventing, treating, and ameliorating diseases, disorders, and conditions are also disclosed herein. Such diseases, disorders, and conditions are thromboembolic conditions. Thromboembolic conditions of the invention include the categories of thrombosis, embolism, and thromboembolism. In certain embodiments such thromboembolic conditions include deep vein thrombosis, pulmonary embolism, myocardial infarction, and stroke. Such diseases, disorders, and conditions can have one or more risk factors, causes, or outcomes in common. Certain risk factors and causes for development of a thromboembolic condition include immobility, surgery (particularly orthopedic surgery), malignancy, pregnancy, older age, use of oral contraceptives, atrial fibrillation, previous thromboembolic condition, chronic inflammatory disease, and inherited or acquired prothrombotic clotting disorders. Certain outcomes associated with development of a thromboembolic condition include decreased blood flow through an affected vessel, death of tissue, and death. Methods of treatment include administering a kallikrein specific inhibitor to an individual in need thereof are also disclosed herein. The kallikrein specific inhibitor is a nucleic acid. The nucleic acid is an antisense compound. The antisense compound is a modified oligonucleotide. Herein, the use of the singular includes the plural unless specifically stated otherwise. As used herein, the use of "or" means "and/or" unless stated otherwise. Additionally, as used herein, the use of "and" means "and/or" unless stated otherwise. Furthermore, the use of the term "including" as well as other forms, such as "includes" and "included", is not limiting. Also, terms such as "element" or "component" encompass both elements and components comprising one unit and elements and components that comprise more than one subunit, unless specifically stated otherwise. Unless specific definitions are provided, the nomenclature utilized in connection with, and the procedures and techniques of, analytical chemistry, synthetic organic chemistry, and medicinal and pharmaceutical chemistry described herein are those well known and commonly used in the art. Standard techniques may be used for chemical synthesis, and chemical analysis. "2'-O-methoxyethyl" (also 2'-MOE and 2'-O(CH2)2-OCH3) refers to an O-methoxy-ethyl modification of the 2' position of a furanosyl ring. A 2'-O-methoxyethyl modified sugar is a modified sugar. "2'-MOE nucleoside" (also 2'-O-methoxyethyl nucleoside) means a nucleoside comprising a 2'-MOE modified sugar moiety. "5-methylcytosine" means a cytosine modified with a methyl group attached to the 5' position. A 5-methylcytosine is a modified nucleobase. "About" means within ±7% of a value. For example, if it is stated, "the compounds affected at least about 70% inhibition of kallikrein", it is implied that the kallikrein levels are inhibited within a range of 63% and 77%. "Active pharmaceutical agent" means the substance or substances in a pharmaceutical composition that provide a therapeutic benefit when administered to an individual. For example, in certain embodiments an antisense oligonucleotide targeted to kallikrein is an active pharmaceutical agent. "Active target region" or "target region" means a region to which one or more active antisense compounds is targeted. "Active antisense compounds" means antisense compounds that reduce target nucleic acid levels or protein levels. "Administered concomitantly" refers to the co-administration of two agents in any manner in which the pharmacological effects of both are manifest in the patient at the same time. Concomitant administration does not require that both agents be administered in a single pharmaceutical composition, in the same dosage form, or by the same route of administration. The effects of both agents need not manifest themselves at the same time. The effects need only be overlapping for a period of time and need not be coextensive. "Administering" means providing a pharmaceutical agent to an individual, and includes, but is not limited to administering by a medical professional and self-administering. "Amelioration" or "ameliorate" or "amerliorating" refers to a lessening of at least one indicator, sign, or symptom of an associated disease, disorder, or condition. The severity of indicators may be determined by subjective or objective measures, which are known to those skilled in the art. "Animal" refers to a human or non-human animal, including, but not limited to, mice, rats, rabbits, dogs, cats, pigs, and non-human primates, including, but not limited to, monkeys and chimpanzees. "Antidote compound" refers to a compound capable of decreasing the intensity or duration of any antisense-mediated activity. "Antidote oligonucleotide" means an antidote compound comprising an oligonucleotide that is complementary to and capable of hybridizing with an antisense compound. "Antidote protein" means an antidote compound comprising a peptide. "Antibody" refers to a molecule characterized by reacting specifically with an antigen in some way, where the antibody and the antigen are each defined in terms of the other. Antibody may refer to a complete antibody molecule or any fragment or region thereof, such as the heavy chain, the light chain, Fab region, and Fc region. "Antisense activity" means any detectable or measurable activity attributable to the hybridization of an antisense compound to its target nucleic acid. In certain embodiments, antisense activity is a decrease in the amount or expression of a target nucleic acid or protein encoded by such target nucleic acid. "Antisense compound" means an oligomeric compound that is capable of undergoing hybridization to a target nucleic acid through hydrogen bonding. Examples of antisense compounds include single-stranded and double-stranded compounds, such as, antisense oligonucleotides, siRNAs, and shRNAs. "Antisense inhibition" means reduction of target nucleic acid levels or target protein levels in the presence of an antisense compound complementary to a target nucleic acid compared to target nucleic acid levels or target protein levels in the absence of the antisense compound. "Antisense oligonucleotide" means a single-stranded oligonucleotide having a nucleobase sequence that permits hybridization to a corresponding region or segment of a target nucleic acid. "Bicyclic sugar" means a furanosyl ring modified by the bridging of two atoms. A bicyclic sugar is a modified sugar. "Bicyclic nucleoside" (also BNA) means a nucleoside having a sugar moiety comprising a bridge connecting two carbon atoms of the sugar ring, thereby forming a bicyclic ring system. In certain embodiments, the bridge connects the 4'-carbon and the 2'-carbon of the sugar ring. "Cap structure" or "terminal cap moiety" means chemical modifications, which have been incorporated at either terminus of an antisense compound. "cEt" or "constrained ethyl" means a bicyclic nucleoside having a sugar moiety comprising a bridge connecting the 4'-carbon and the 2'-carbon, wherein the bridge has the formula: 4'-CH(CH3)-O-2'. "Constrained ethyl nucleoside" (also cEt nucleoside) means a nucleoside comprising a bicyclic sugar moiety comprising a 4'-CH(CH3)-O-2' bridge. "Chemically distinct region" refers to a region of an antisense compound that is in some way chemically different than another region of the same antisense compound. For example, a region having 2'-O-methoxyethyl nucleotides is chemically distinct from a region having nucleotides without 2'-O-methoxyethyl modifications. "Chimeric antisense compound" means an antisense compound that has at least two chemically distinct regions. "Co-administration" means administration of two or more pharmaceutical agents to an individual. The two or more pharmaceutical agents may be in a single pharmaceutical composition, or may be in separate pharmaceutical compositions. Each of the two or more pharmaceutical agents may be administered through the same or different routes of administration. Co-administration encompasses parallel or sequential administration. "Coagulation factor" means any of factors I, II, III, IV, V, VII, VIII, IX, X, XI, XII, XIII, TAFI, or kallikrein in the blood coagulation cascade. "Coagulation factor nucleic acid" means any nucleic acid encoding a coagulation factor. 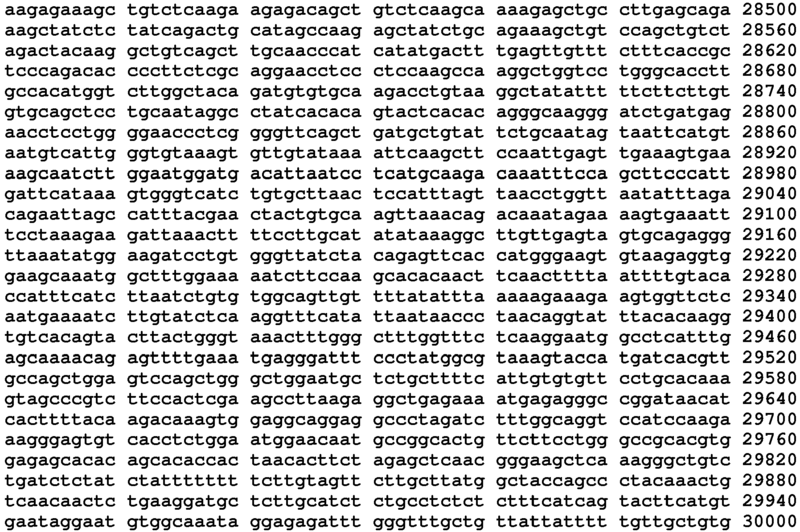 For example, in certain embodiments, a coagulation factor nucleic acid includes, without limitation, a DNA sequence encoding a coagulation factor (including genomic DNA comprising introns and exons), an RNA sequence transcribed from DNA encoding a coagulation factor, and an mRNA sequence encoding a coagulation factor. "Coagulation factor mRNA" means an mRNA encoding a coagulation factor protein. "Complementarity" means the capacity for pairing between nucleobases of a first nucleic acid and a second nucleic acid. "Contiguous nucleobases" means nucleobases immediately adjacent to each other. "Diluent" means an ingredient in a composition that lacks pharmacological activity, but is pharmaceutically necessary or desirable. For example, the diluent in an injected composition may be a liquid, e.g. saline solution. "Dose" means a specified quantity of a pharmaceutical agent provided in a single administration, or in a specified time period. In certain embodiments, a dose may be administered in one, two, or more boluses, tablets, or injections. For example, in certain embodiments where subcutaneous administration is desired, the desired dose requires a volume not easily accommodated by a single injection, therefore, two or more injections may be used to achieve the desired dose. In certain embodiments, the pharmaceutical agent is administered by infusion over an extended period of time or continuously. Doses may be stated as the amount of pharmaceutical agent per hour, day, week, or month. "Effective amount" means the amount of active pharmaceutical agent sufficient to effectuate a desired physiological outcome in an individual in need of the agent. The effective amount may vary among individuals depending on the health and physical condition of the individual to be treated, the taxonomic group of the individuals to be treated, the formulation of the composition, assessment of the individual's medical condition, and other relevant factors. "Kallikrein" means any nucleic acid or protein of KLKB1. In certain embodiments, KLKB1 is the term generally associated with the gene. In certain embodiments, the expression product of KLKB1 translation is generally termed plasma prekallikrein. Plasma prekallikrein is cleaved by Factor 12a. In certain embodiments, the cleavage product is generally termed plasma kallikrein. Plasma kallikrein is the substrate that C1-INH acts upon. As used herein, "kallikrein" means KLKB1 and its expression products, including, for example plasma prekallikrein and plasma kallikrein. "Kallikrein nucleic acid" (aka KLKB1, plasma prekallikrein, plasma kallikrein, Fletcher factor, kallikrein B) means any nucleic acid encoding kallikrein. For example, in certain embodiments, a kallikrein nucleic acid includes a DNA sequence encoding kallikrein, an RNA sequence transcribed from DNA encoding kallikrein (including genomic DNA comprising introns and exons), and an mRNA sequence encoding kallikrein. "Kallikrein mRNA" means an mRNA encoding a kallikrein protein. "Kallikrein specific inhibitor" refers to any agent capable of specifically inhibiting kallikrein mRNA and/or kallikrein protein expression or activity at the molecular level. For example, kallikrein specific inhibitors include nucleic acids (including antisense compounds), peptides, antibodies, small molecules, and other agents capable of inhibiting the expression of kallikrein mRNA and/or kallikrein protein. In certain embodiments, by specifically modulating kallikrein mRNA expression and/or kallikrein protein expression, kallikrein specific inhibitors may affect other components of the coagulation cascade including downstream components. Similarly, in certain embodiments, kallikrein specific inhibitors may affect other molecular processes in an animal. "Kallikrein specific inhibitor antidote" means a compound capable of decreasing the effect of a kallikrein specific inhibitor. In certain embodiments, a kallikrein specific inhibitor antidote is selected from a kallikrein peptide; a kallikrein antidote oligonucleotide, including a kallikrein antidote compound complementary to a kallikrein antisense compound; and any compound or protein that affects the intrinsic or extrinsic coagulation pathway. "Fully complementary" or "100% complementary" means each nucleobase of a first nucleic acid has a complementary nucleobase in a second nucleic acid. In certain embodiments, a first nucleic acid is an antisense compound and a target nucleic acid is a second nucleic acid. "Gapmer" means a chimeric antisense compound in which an internal region having a plurality of nucleosides that support RNase H cleavage is positioned between external regions having one or more nucleosides, wherein the nucleosides comprising the internal region are chemically distinct from the nucleoside or nucleosides comprising the external regions. The internal region may be referred to as a "gap" and the external regions may be referred to as the "wings." "Gap-widened" means a chimeric antisense compound having a gap segment of 12 or more contiguous 2'-deoxyribonucleosides positioned between and immediately adjacent to 5' and 3' wing segments having from one to six nucleosides. "Hybridization" means the annealing of complementary nucleic acid molecules. In certain embodiments, complementary nucleic acid molecules include an antisense compound and a target nucleic acid. "Identifying an animal at risk for thromboembolic conditions" means identifying an animal having been diagnosed with a thromboembolic condition or identifying an animal predisposed to develop a thromboembolic condition. Individuals predisposed to develop a thromboembolic condition include those having one or more risk factors for thromboembolic conditions including immobility, surgery (particularly orthopedic surgery), malignancy, pregnancy, older age, use of oral contraceptives, and inherited or acquired prothrombotic clotting disorders. Such identification may be accomplished by any method including evaluating an individual's medical history and standard clinical tests or assessments. "Immediately adjacent" means there are no intervening elements between the immediately adjacent elements. "Individual" means a human or non-human animal selected for treatment or therapy. "Inhibiting kallikrein" means reducing expression of kallikrein mRNA and/or protein levels in the presence of a kallikrein specific inhibitior, including a kallikrein antisense oligonucleotide, as compared to expression of kallikrein mRNA and/or protein levels in the absence of a kallikrein specific inhibitor, such as a kallikrein antisense oligonucleotide. "Internucleoside linkage" refers to the chemical bond between nucleosides. "Linked nucleosides" means adjacent nucleosides which are bonded together. "Mismatch" or "non-complementary nucleobase" refers to the case when a nucleobase of a first nucleic acid is not capable of pairing with the corresponding nucleobase of a second or target nucleic acid. "Modified internucleoside linkage" refers to a substitution or any change from a naturally occurring internucleoside bond (i.e. a phosphodiester internucleoside bond). "Modified nucleobase" refers to any nucleobase other than adenine, cytosine, guanine, thymidine, or uracil. An "unmodified nucleobase" means the purine bases adenine (A) and guanine (G), and the pyrimidine bases thymine (T), cytosine (C), and uracil (U). "Modified nucleotide" means a nucleotide having, independently, a modified sugar moiety, modified internucleoside linkage, or modified nucleobase. A "modified nucleoside" means a nucleoside having, independently, a modified sugar moiety or modified nucleobase. "Modified oligonucleotide" means an oligonucleotide comprising a modified internucleoside linkage, a modified sugar, or a modified nucleobase. "Modified sugar" refers to a substitution or change from a natural sugar. "Motif' means the pattern of chemically distinct regions in an antisense compound. "Naturally occurring internucleoside linkage" means a 3' to 5' phosphodiester linkage. "Natural sugar moiety" means a sugar found in DNA (2'-H) or RNA (2'-OH). "Nucleic acid" refers to molecules composed of monomeric nucleotides. A nucleic acid includes ribonucleic acids (RNA), deoxyribonucleic acids (DNA), single-stranded nucleic acids, double-stranded nucleic acids, small interfering ribonucleic acids (siRNA), and microRNAs (miRNA). "Nucleobase" means a heterocyclic moiety capable of pairing with a base of another nucleic acid. "Nucleobase sequence" means the order of contiguous nucleobases independent of any sugar, linkage, or nucleobase modification. "Nucleoside" means a nucleobase linked to a sugar. "Nucleoside mimetic" includes those structures used to replace the sugar or the sugar and the base and not necessarily the linkage at one or more positions of an oligomeric compound such as for example nucleoside mimetics having morpholino, cyclohexenyl, cyclohexyl, tetrahydropyranyl, bicyclo, or tricyclo sugar mimetics, e.g., non furanose sugar units. Nucleotide mimetic includes those structures used to replace the nucleoside and the linkage at one or more positions of an oligomeric compound such as for example peptide nucleic acids or morpholinos (morpholinos linked by -N(H)-C(=O)-O- or other non-phosphodiester linkage). Sugar surrogate overlaps with the slightly broader term nucleoside mimetic but is intended to indicate replacement of the sugar unit (furanose ring) only. The tetrahydropyranyl rings provided herein are illustrative of an example of a sugar surrogate wherein the furanose sugar group has been replaced with a tetrahydropyranyl ring system. "Nucleotide" means a nucleoside having a phosphate group covalently linked to the sugar portion of the nucleoside. "Oligomeric compound" or "oligomer" means a polymer of linked monomeric subunits which is capable of hybridizing to at least a region of a nucleic acid molecule. "Oligonucleotide" means a polymer of linked nucleosides each of which can be modified or unmodified, independent one from another. "Parenteral administration" means administration through injection or infusion. Parenteral administration includes subcutaneous administration, intravenous administration, intramuscular administration, intraarterial administration, intraperitoneal administration, or intracranial administration, e.g., intrathecal or intracerebroventricular administration. "Peptide" means a molecule formed by linking at least two amino acids by amide bonds. Peptide refers to polypeptides and proteins. "Pharmaceutical composition" means a mixture of substances suitable for administering to an individual. For example, a pharmaceutical composition may comprise one or more active pharmaceutical agents and a sterile aqueous solution. "Pharmaceutically acceptable derivative" encompasses pharmaceutically acceptable salts, conjugates, prodrugs or isomers of the compounds described herein. "Pharmaceutically acceptable salts" means physiologically and pharmaceutically acceptable salts of antisense compounds, i.e., salts that retain the desired biological activity of the parent oligonucleotide and do not impart undesired toxicological effects thereto. "Phosphorothioate linkage" means a linkage between nucleosides where the phosphodiester bond is modified by replacing one of the non-bridging oxygen atoms with a sulfur atom. A phosphorothioate linkage (P=S) is a modified internucleoside linkage. "Portion" means a defined number of contiguous (i.e., linked) nucleobases of a nucleic acid. In certain embodiments, a portion is a defined number of contiguous nucleobases of a target nucleic acid. In certain embodiments, a portion is a defined number of contiguous nucleobases of an antisense compound. "Prevent" or "preventing" refers to delaying or forestalling the onset or development of a disease, disorder, or condition for a period of time from minutes to indefinitely. Prevent also means reducing risk of developing a disease, disorder, or condition. "Prodrug" means a therapeutic agent that is prepared in an inactive form that is converted to an active form within the body or cells thereof by the action of endogenous enzymes or other chemicals or conditions. "Side effects" means physiological responses attributable to a treatment other than the desired effects. In certain embodiments, side effects include injection site reactions, liver function test abnormalities, renal function abnormalities, liver toxicity, renal toxicity, central nervous system abnormalities, myopathies, and malaise. For example, increased aminotransferase levels in serum may indicate liver toxicity or liver function abnormality. For example, increased bilirubin may indicate liver toxicity or liver function abnormality. "Single-stranded oligonucleotide" means an oligonucleotide which is not hybridized to a complementary strand. "Specifically hybridizable" refers to an antisense compound having a sufficient degree of complementarity between an antisense oligonucleotide and a target nucleic acid to induce a desired effect, while exhibiting minimal or no effects on non-target nucleic acids under conditions in which specific binding is desired, i.e., under physiological conditions in the case of in vivo assays and therapeutic treatments. "Targeting" or "targeted" means the process of design and selection of an antisense compound that will specifically hybridize to a target nucleic acid and induce a desired effect. "Target nucleic acid," "target RNA," and "target RNA transcript" all refer to a nucleic acid capable of being targeted by antisense compounds. "Target segment" means the sequence of nucleotides of a target nucleic acid to which an antisense compound is targeted. "5' target site" refers to the 5'-most nucleotide of a target segment. "3' target site" refers to the 3'-most nucleotide of a target segment. "Therapeutically effective amount" means an amount of a pharmaceutical agent that provides a therapeutic benefit to an individual. "Thromboembolic condition" means any disease, disorder, or condition involving an embolism caused by a thrombus. Examples of such diseases, disorders, and conditions include the categories of thrombosis, embolism, and thromboembolism. In certain embodiments, such disease disorders, and conditions include deep vein thrombosis, pulmonary embolism, myocardial infarction, and stroke. "Treat" or "treating" refers to administering a pharmaceutical composition to effect an alteration or improvement of a disease, disorder, or condition. "Unmodified nucleotide" means a nucleotide composed of naturally occuring nucleobases, sugar moieties, and internucleoside linkages. In certain embodiments, an unmodified nucleotide is an RNA nucleotide (i.e. β-D-ribonucleosides) or a DNA nucleotide (i.e. β-D-deoxyribonucleoside). Methods for decreasing kallikrein mRNA and protein expression are disclosed herein. Methods for the treatment, prevention, or amelioration of diseases, disorders, and conditions associated with kallikrein in an individual in need thereof are also disclosed herein. Also contemplated are methods for the preparation of a medicament for the treatment, prevention, or amelioration of a disease, disorder, or condition associated with kallikrein. Kallikrein associated diseases, disorders, and conditions include thromboembolic conditions such as thrombosis, embolism, thromboembolism, deep vein thrombosis, pulmonary embolism, myocardial infarction, and stroke. Certain embodiments of the disclosure provide for the use of a kallikrein specific inhibitor for treating, preventing, or ameliorating a kallikrein associated disease. Kallikrein specific inhibitors which are nucleic acids (including antisense compounds), peptides, antibodies, small molecules, and other agents capable of inhibiting the expression of kallikrein mRNA and/or kallikrein protein are also disclosed herein. In certain embodiments of the disclosure, kallikrein specific inhibitors are peptides or proteins, such as, but not limited to, lympho-epithelial Kazal-type-related inhibitor (LEKTI) as described in J Proteome Res 2010; 9: 4389-4394; ecotin-Pkal as described in Biol Chem 2010; 391: 425-433; aprotinin as described in J Hypertens 1987; 5: 581-586; PK15 as described in Nat Chem Biol 2009; 5: 502-507; kallistatin as described in Biol Chem 2001; 382: 15-21 and J Biol Chem 1992; 267: 25873-25880; C1-inhibitor as described in Thromb Haemost 2004; 92: 1277-1283 and Adv Biosci 1978; 17: 93-101; CeKI as described in Biol Chem 2004; 385: 1083-1086; AdKi as described in Toxicon 2004; 43: 219-223; FE999024 as described in Am J Pathol 2001; 159: 1797-1805; Arginine-15-aprotinin as described in Adv Exp Med Biol 1989; 247B: 15-21; alpha-1-antitrypsin-Pittsburgh as described in J Clin Invest 1986; 77: 631-634; and kallikrein inhibitors as described in US Patent No. 7,235,530 , USPPN 2006/0069020 , USPPN 2008/0188409 , USPPN 2008/0221031 , USPPN 2009/0221480 , USPPN 2009/0227494 , USPPN 2009/0227495 , USPPN 2009/0233852 , USPPN 2009/0234009 , USPPN 2009/0247453 , USPPN 2009/0264350 , USPPN 2009/0075887 ; USPPN 2009/0105142 , USPPN 2010/0183625 , and US Patent No. 4,973,668 . In certain embodiments of the disclosure, kallikrein specific inhibitors are antibodies, such as, but not limited to, DX-2300 as described in Biochem J 2009; 422: 383-392. In certain embodiments of the disclosure, kallikrein specific inhibitors are small molecules, such as, but not limited to, Ecallantide (DX-88 by Dyax Corp) as described in Ann Allergy Asthma Immunol 2010; 105: 430-436 and Drugs Today 2010; 46: 547-555; Nafamostat mesilate as described in J Anesth 2010; 24: 549-552 and Br J Aneaesth 1998; 81: 963-964; CU-2010 as described in Anesthesiology 2009; 110: 123-130; VA999024 and VA999026 as described in Immunopharmacology 1996; 32: 115-118; PKSI-527 (trans-4-aminomethylcyclohexanecarbonylphenylalanine 4-carboxymethylanilide hydrochloride) as described in Thromb Res 2005; 116: 403-408; and kallikrein inhibitors as described in US Patent No. 4,153,687 . Methods of treating, preventing, or ameliorating a thromboembolic condition in an animal, comprising administering to the animal a therapeutically effective amount of a kallikrein specific inhibitor, wherein the thromboembolic condition is ameliorated in the animal are disclosed herein. In certain embodiments, the animal is a human. In certain embodiments, the thromboembolic condition is any of the group consisting of thrombosis, embolism, thromboembolism, deep vein thrombosis, pulmonary embolism, myocardial infarction, and stroke. The kallikrein specific inhibitior is an antisense compound. The antisense compound is a modified oligonucleotide. The kallikrein specific inhibitor is a nucleic acid. The nucleic acid is a modified oligonucleotide. The kallikrein specific inhibitor is a modified oligonucleotide. In certain embodiments, the modified oligonucleotide consists of 12 to 30 linked nucleosides. In certain embodiments, the modified oligonucleotide is a single-stranded oligonucleotide. In certain embodiments, the modified oligonucleotide consists of 15, 16, 17, 18, 19, or 20 linked nucleosides. In certain embodiments, the modified oligonucleotide has a nucleobase sequence that is 90%, 95%, or 100% complementary to a human kallikrein nucleic acid. In certain embodiments, the modified oligonucleotide comprises at least one modified internucleoside linkage. In certain embodiments, each modified internucleoside linkage is a phosphorothioate internucleoside linkage. In certain embodiments, at least one nucleoside of the modified oligonucleotide comprises a modified sugar. In certain embodiments, the modified sugar is a bicyclic sugar. In certain embodiments, the bicyclic sugar comprises a 4'-CH(CH3)-O-2' bridge, a 4'-(CH2)-O-2' bridge, or 4'-(CH2)2-O-2' bridge. In certain embodiments, the modified sugar comprises a 2'-O-methoxyethyl group. In certain embodiments, at least one nucleoside of the modified oligonucleotide comprises a modified nucleobase. In certain embodiments, the modified nucleobase is a 5'-methylcytosine. wherein Bx is an optionally protected heterocyclic base moiety. (iii) a 3' wing segment consisting of linked nucleosides, wherein the gap segment is positioned immediately adjacent to and between the 5' wing segment and the 3' wing segment and wherein each nucleoside of each wing segment comprises a modified sugar. In some such embodiments, each cytosine in the modified oligonucleotide is a 5-methylcytosine. 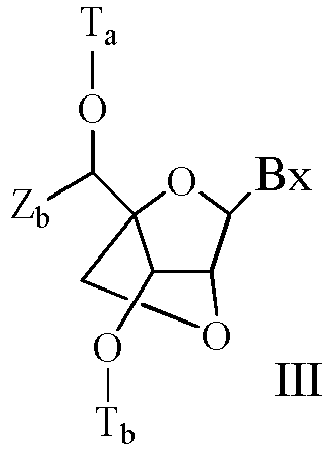 (iii) a 3' wing segment consisting of five linked nucleosides, wherein the gap segment is positioned immediately adjacent to and between the 5' wing segment and the 3' wing segment, wherein each nucleoside of each wing segment comprises a 2'-O-methoxyethyl sugar; and wherein each internucleoside linkage is a phosphorothioate linkage. In some such embodiments, each cytosine in the modified oligonucleotide is a 5-methylcytosine. 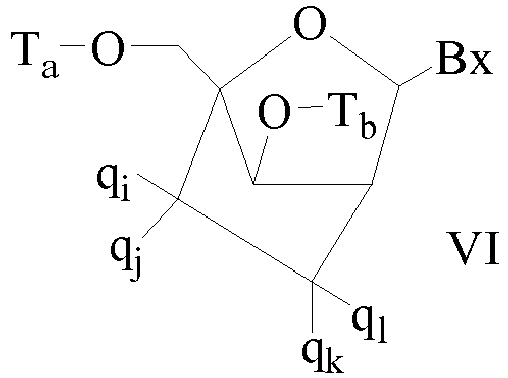 Methods comprising (1) identifying an animal at risk for a thromboembolic condition; and (2) administering to the at risk animal a therapeutically effective amount of a modified oligonucleotide consisting of 12 to 30 linked nucleosides, wherein the modified oligonucleotide is at least 80% complementary to a kallikrein nucleic acid are disclosed herein. In certain embodiments, the modified oligonucleotide is at least 90% complementary to a human kallikrein nucleic acid. In certain embodiments, the modified oligonucleotide is 100% complementary to a human kallikrein nucleic acid. Methods comprising treating a thromboembolic condition in an animal by administering to the animal a therapeutically effective amount of a kallkrein specific inhibitor are also disclosed herein. Methods comprising treating a thromboembolic condition in an animal by administering to the animal a therapeutically effective amount of a modified oligonucleotide consisting of 12 to 30 linked nucleosides, wherein the modified oligonucleotide is at least 90% complementary to a kallikrein nucleic acid are also disclosed herein. Methods comprising inhibiting thrombus formation in an animal by administering to the animal a therapeutically effective amount of a kallkrein specific inhibitor are also disclosed herein. Methods comprising treating a thromboembolic condition in an animal by administering to the animal a therapeutically effective amount of a modified oligonucleotide consisting of 12 to 30 linked nucleosides, wherein the modified oligonucleotide is at least 90% complementary to a kallikrein nucleic acid are also disclosed herein. In certain embodiments of the disclosure, the administering of a kallikrein specific inhibior inhibits thrombus and clot formation. In further embodiments of the invention, the antisense compound for use according to the invention inhibits thrombus and clot formation. In certain embodiments of the disclosure, the administering of a kallikrein specific inhibitor prolongs aPTT. In further embodiments of the invention, the antisense compound for use according to the invention prolongs aPTT. In certain embodiments of the disclosure, the administering of a kallikrein specific inhibitor does not prolong PT. In further embodiments of the invention, the antisense compound for use according to the invention does not prolong PT. In certain embodiments of the disclosure, the administering of a kallikrein specific inhibitor prolongs aPTT and does not prolong PT. In further embodiments of the invention, the antisense compound for use according to the invention prolongs aPTT and does not prolong PT. In certain embodiments of the disclosure, the administering of a kallikrein specific inhibitor decreases Platelet Factor 4 (PF-4). In further embodiments of the invention, the antisense compound for use according to the invention decreases Platelet Factor 4 (PF-4). In certain embodiments of the disclosure, the administering of a kallikrein specific inhibitor increases time for thrombus formation. In further embodiments of the invention, the antisense compound for use according to the invention increases time for thrombus formation. In certain embodiments of the disclosure, the administering of a kallikrein specific inhibitor reduces platelet aggregation. In further embodiments of the invention, the antisense compound for use according to the invention reduces platelet aggregation. In certain embodiments of the disclosure, the administering of a kallikrein specific inhibitor reduces fibrin formation. In further embodiments of the invention, the antisense compound for use according to the invention reduces fibrin formation. In certain embodiments of the disclosure, the administering of a kallikrein specific inhibitor does not increase bleeding in the at risk, treated animal as compared to an animal not administered a kallikrein specific inhibitor. In certain embodiments of the invention, the antisense compound for use according to the invention does not increase bleeding in the at risk, treated animal as compared to an animal not administered a modified oligonucleotide. In certain embodiments, the kallikrein nucleic acid is a human kallikrein nucleic acid. In certain embodiments, the thromboembolic condition is any of the group consisting of thrombosis, embolism, thromboembolism, deep vein thrombosis, pulmonary embolism, myocardial infarction, stroke, or a combination thereof. In certain embodiments of the invention, the antisense compound for use according to the invention is for co-administration with any of the group selected from aspirin, clopidogrel, dipyridamole, heparin, lepirudin, ticlopidine, warfarin, apixaban, rivaroxaban, and LOVENOX. In certain embodiments of the invention, the antisense compound for use according to the invention is for co-administration with an anti-platelet therapy. In certain embodiments, the anti-platelet therapy is any of the group selected from an ADP receptor inhibitor, NSAID, phosphodiesterase inhibitor, glycoprotein IIB/IIIA inhibitor, adenosine reuptake inhibitor, or a combination thereof. In certain embodiments, the NSAID is aspirin, naproxen, or a combination of both. In certain embodiments of the invention, the antisense compound for use according to the invention for concomitant administration with any of the group selected from aspirin, clopidogrel, dipyridamole, heparin, lepirudin, ticlopidine, warfarin, apixaban, rivaroxaban, and LOVENOX. In certain embodiments of the invention, the antisense compound for use according to the invention is for concomitant administration with an anti-platelet therapy. In certain embodiments, the anti-platelet therapy is any of the group selected from an ADP receptor inhibitor, NSAID, phosphodiesterase inhibitor, glycoprotein IIB/IIIA inhibitor, adenosine reuptake inhibitor, or a combination thereof. In certain embodiments, the NSAID is aspirin, naproxen, or a combination of both. In certain embodiments of the invention, the antisense compound for use according to the invention is for parenteral administration. In certain embodiments, the parenteral administration is any of subcutaneous or intravenous administration. Also disclosed is the use of kallikrein specific inhibitors as described herein in the manufacture of a medicament for treating, ameliorating, or preventing a thromboembolic condition such as thrombosis, embolism, thromboembolism, deep vein thrombosis, pulmonary embolism, myocardial infarction, and stroke. Also disclosed is the use of a kallikrein specific inhibitor as described herein for treating, ameliorating, or preventing a thromboembolic condition such as thrombosis, embolism, thromboembolism, deep vein thrombosis, pulmonary embolism, myocardial infarction, and stroke. Also disclosed is the use of a kallikrein specific inhibitor as described herein in the manufacture of a medicament for treating, preventing, or ameliorating a thromboembolic condition as described herein in a patient who is subsequently administered an additional agent or therapy as described herein. Also disclosed is the use of a kallikrein specific inhibitor as described herein for treating, preventing, or ameliorating a thromboembolic condition as described herein in a patient who is subsequently administered an additional agent or therapy as described herein. (ii) an additional agent or therapy as described herein. A kit as described herein may further include instructions for using the kit to treat, prevent, or ameliorate a thromboembolic condition as described herein by combination therapy as described herein. In certain embodiments, the invention provides an antisense compound comprising a modified oligonucleotide. In certain embodiments, the antisense compound of the invention comprises a modified oligonucleotide consisting of 12 to 30 linked nucleosides. In certain embodiments, the modified oligonucleotide targets a kallikrein nucleic acid. In certain embodiments, the kallikrein nucleic acid may be selected from, but is not limited to, one or more of GENBANK Accession No. 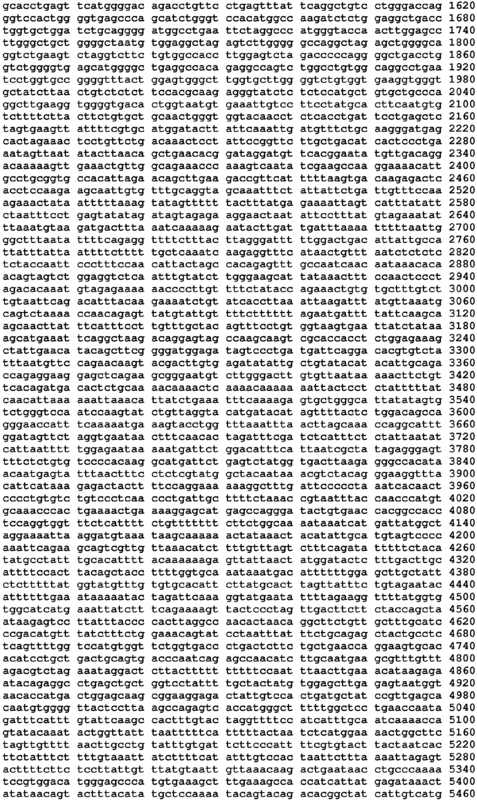 NM_000892.3 (incorporated herein as SEQ ID NO: 1), GENBANK Accession No. 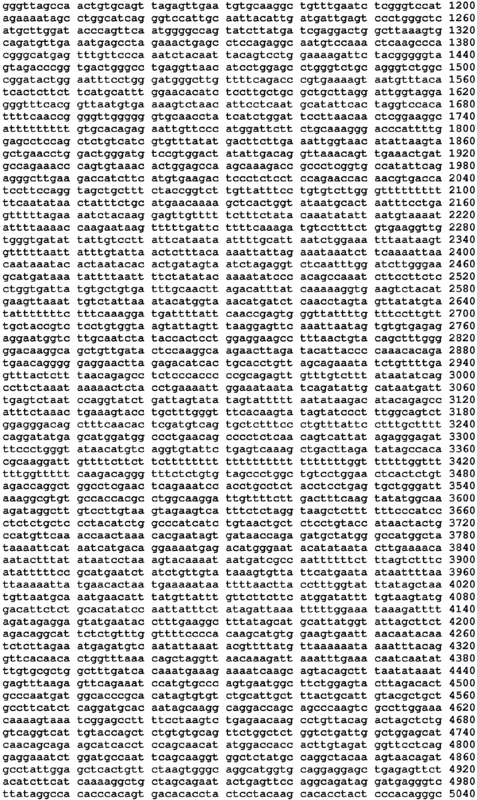 DC412984.1 (incorporated herein as SEQ ID NO: 2), GENBANK Accession No. 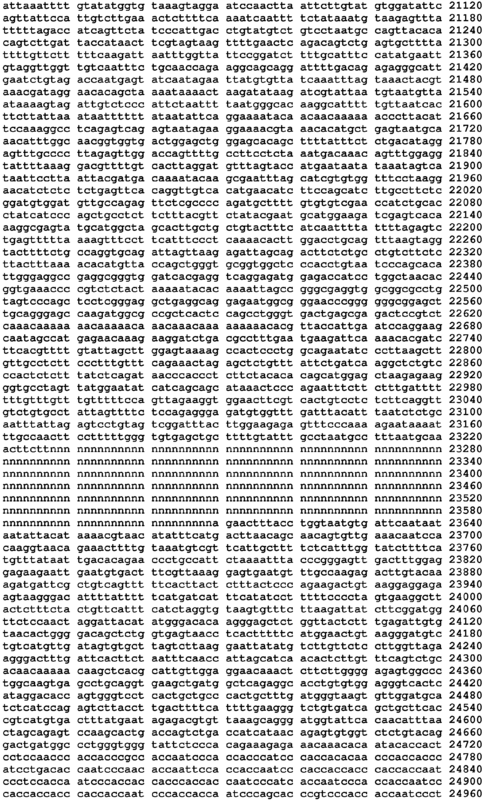 CN265612.1 (incorporated herein as SEQ ID NO: 3), GENBANK Accession No. 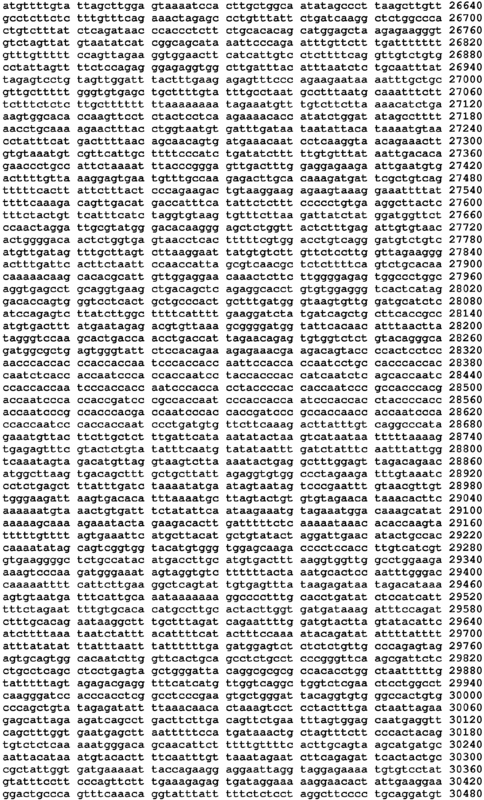 AK297672.1 (incorporated herein as SEQ ID NO: 4), GENBANK Accession No. 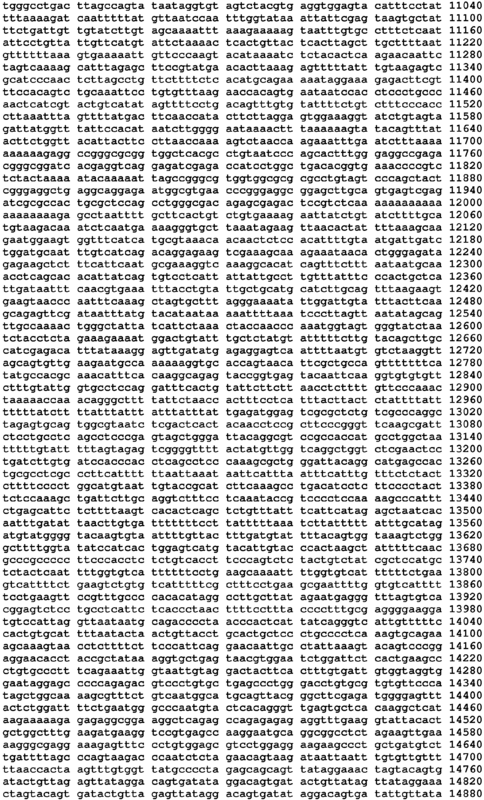 DC413312.1 (incorporated herein as SEQ ID NO: 5), GENBANK Accession No. 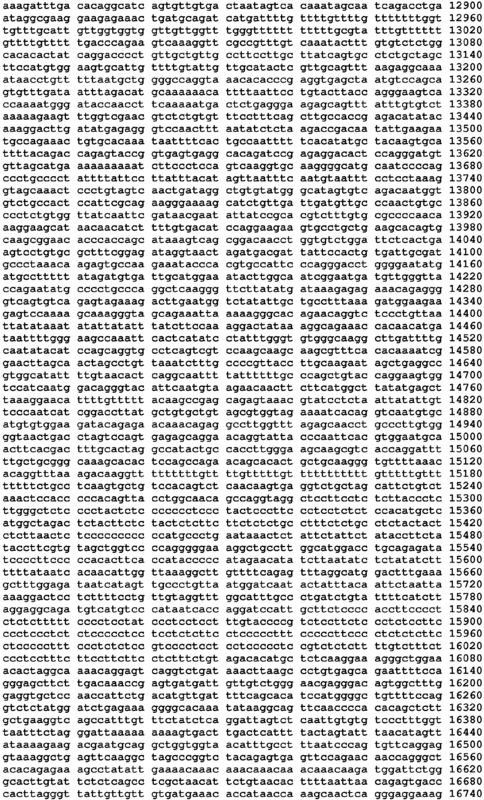 AV688858.2 (incorporated herein as SEQ ID NO: 6), GENBANK Accession No. 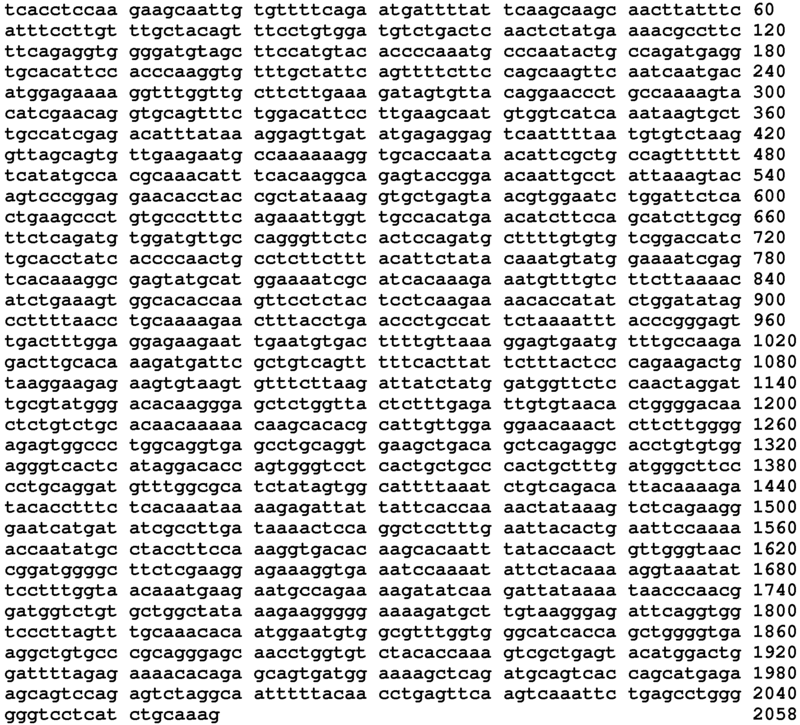 CD652077.1 (incorporated herein as SEQ ID NO: 7), GENBANK Accession No. 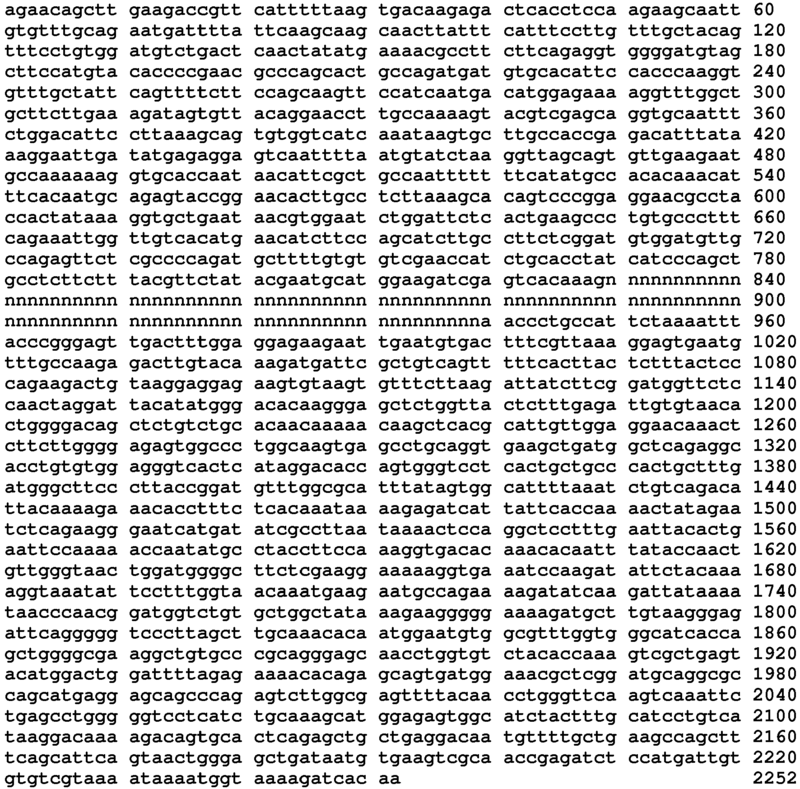 BC143911.1 (incorporated herein as SEQ ID NO: 8), GENBANK Accession No. 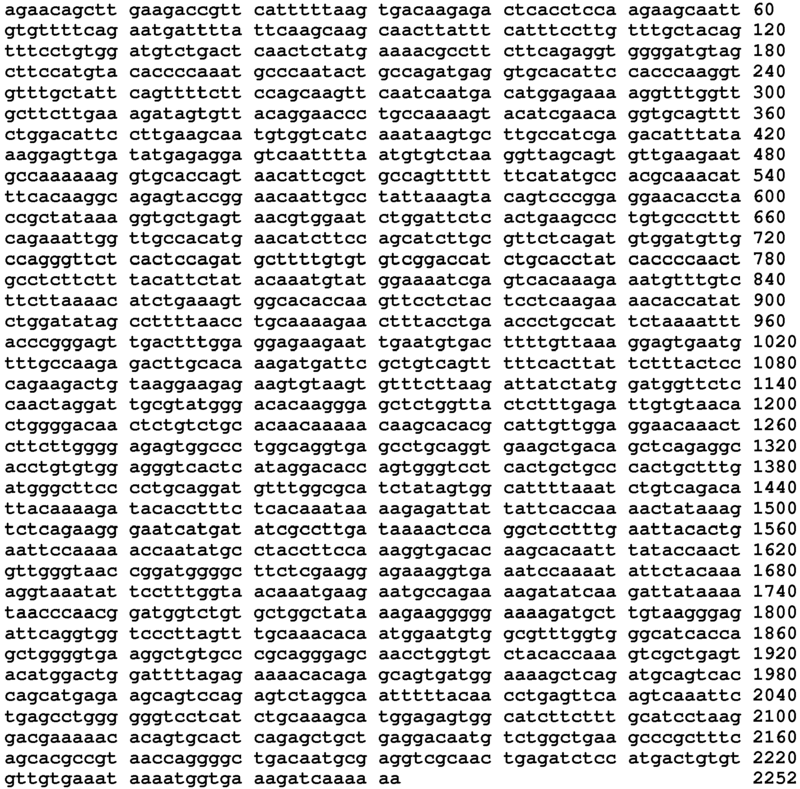 CB162532.1 (incorporated herein as SEQ ID NO: 9), GENBANK Accession No. 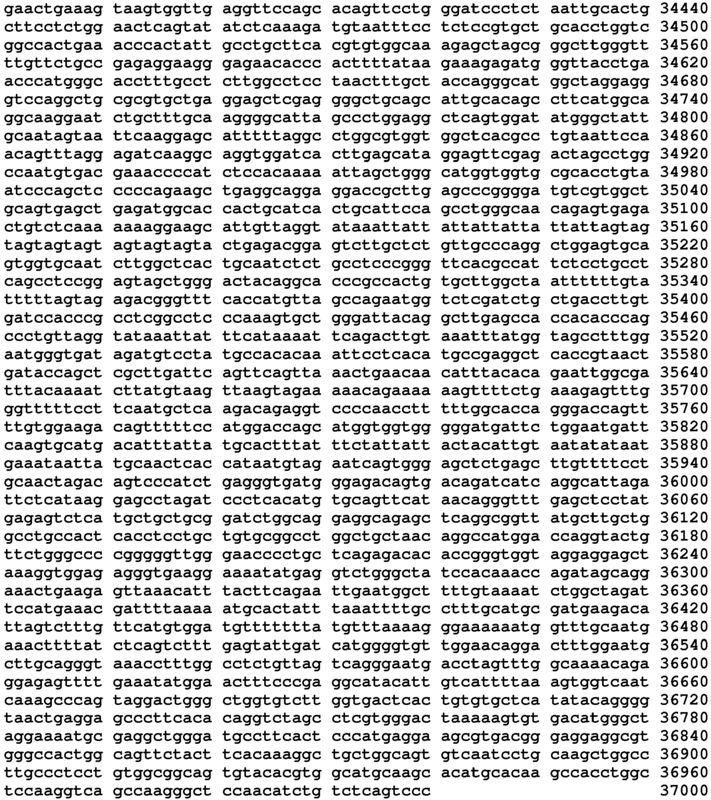 NT_016354.19 truncated from nucleobases 111693001 to 111730000 (incorporated herein as SEQ ID NO: 10), GENBANK Accession No. 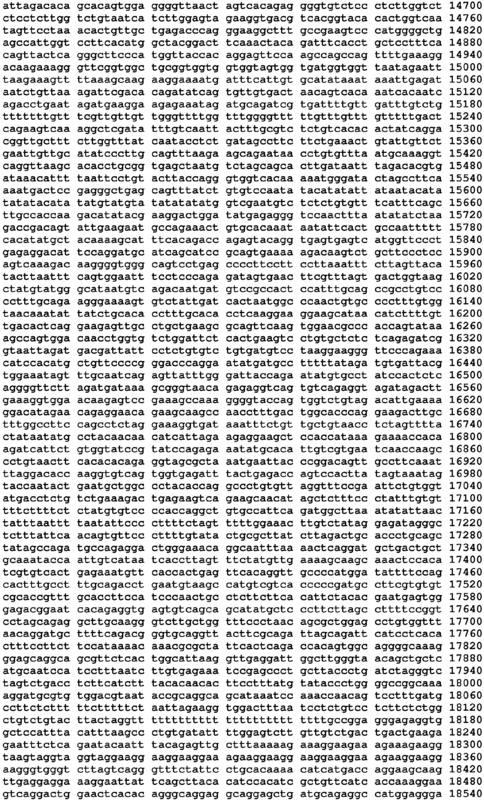 NM_008455.2 (incorporated herein as SEQ ID NO: 11), GENBANK Accession No. BB598673.1 (incorporated herein as SEQ ID NO: 12), the complement of GENBANK Accession No. 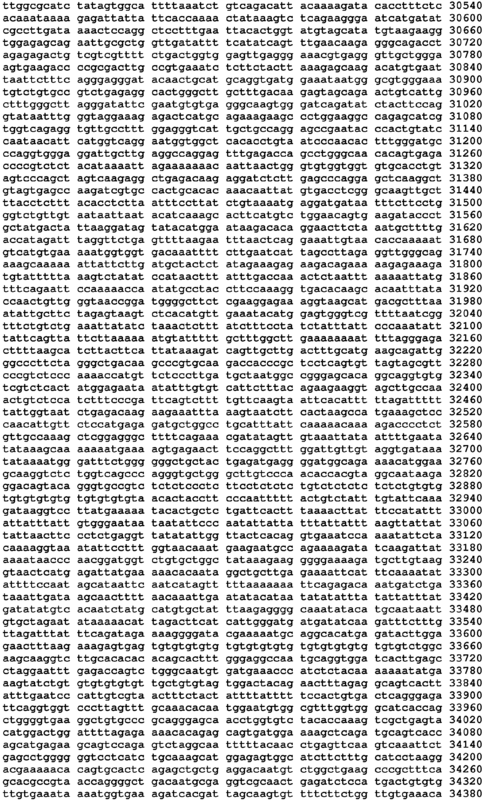 NT_039460.7 truncated from nucleobases 6114001 to 6144000 (incorporated herein as SEQ ID NO: 13), GENBANK Accession No. 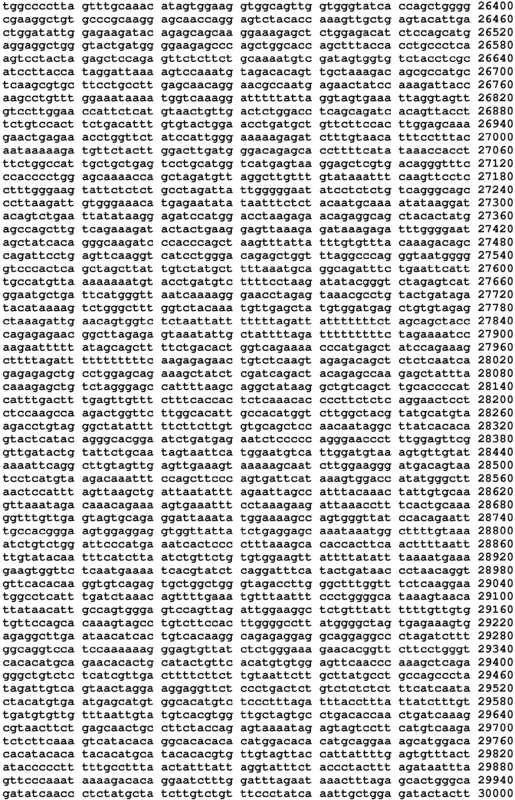 NM_012725.2 (incorporated herein as SEQ ID NO: 14), GENBANK Accession No. 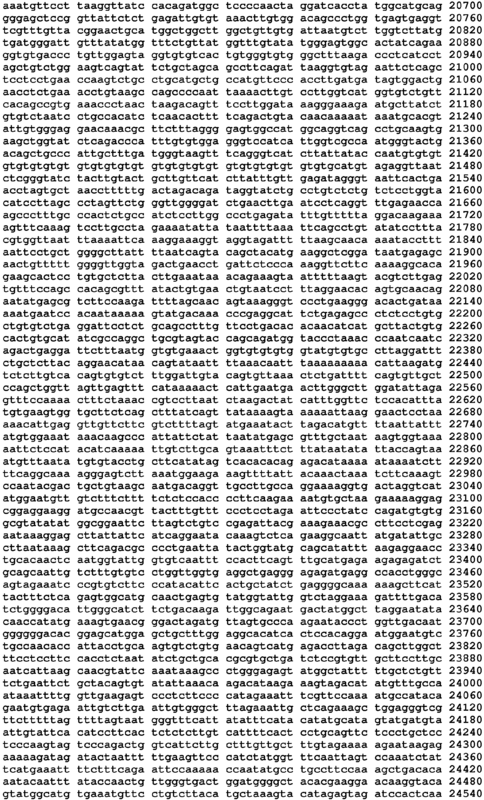 NW_047473.1 truncated from nucleobases 10952001 to 10982000 (incorporated herein as SEQ ID NO: 15), exons 1-7 and 9-15 cut from the rhesus genomic sequence GENBANK Accession No. 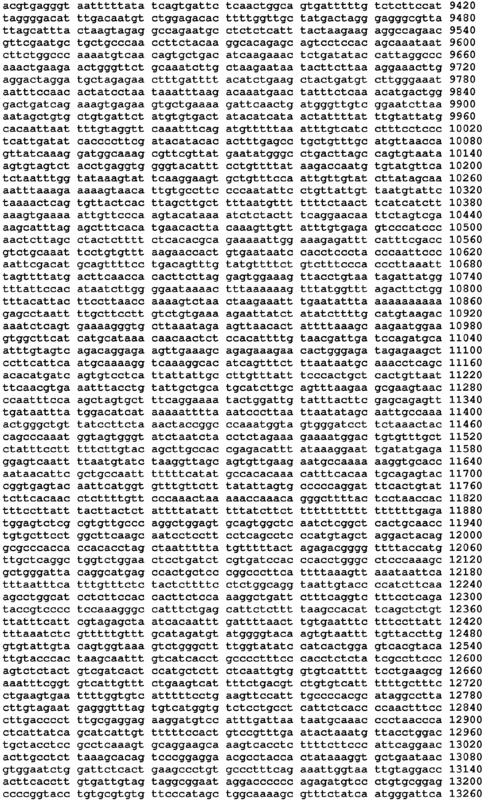 NW_001118167.1 based on similarity to human exons and where rhesus exon 8 has been replaced with N (110) (incorporated herein as SEQ ID NO: 16), GENBANK Accession No. 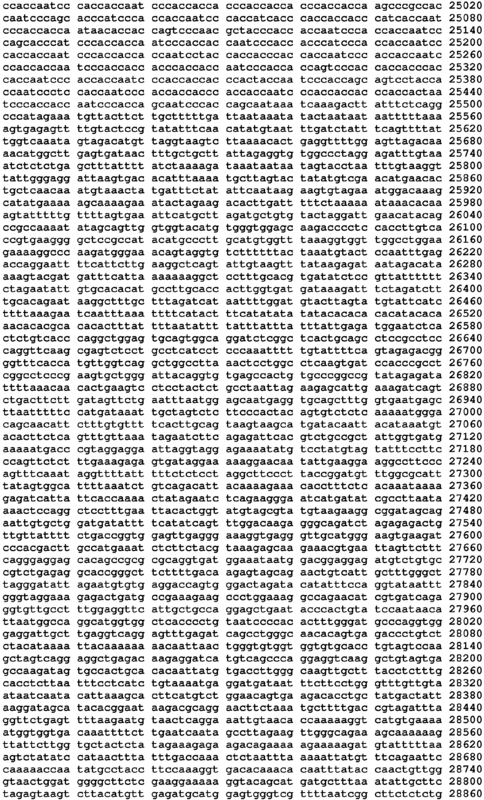 XM_002804276.1 (incorporated herein as SEQ ID NO: 17), GENBANK Accession No. 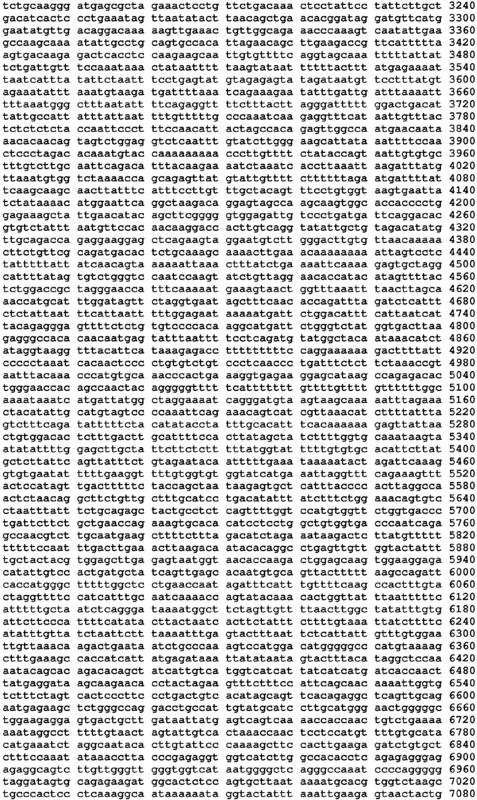 NW_001118167.1 truncated from nucleobases 2358000 to 2391000 (incorporated herein as SEQ ID NO: 18), and exons 1-15 assembled from trace archive of baboon based on homology to human (incorporated herein as SEQ ID NO: 19). In certain embodiments, the antisense compound of the invention may comprise a modified oligonucleotide comprising a nucleobase sequence at least 90%, at least 95%, at least 96%, at least 97%, at least 98%, or at least 99% complementary to an equal length portion of SEQ ID NO: 1, SEQ ID NO: 2, SEQ ID NO: 3, SEQ ID NO: 4, SEQ ID NO: 5, SEQ ID NO: 6, SEQ ID NO: 7, SEQ ID NO: 8, SEQ ID NO: 9, SEQ ID NO: 10, SEQ ID NO: 11, SEQ ID NO: 12, SEQ ID NO: 13, SEQ ID NO: 14, SEQ ID NO: 15, SEQ ID NO: 16, SEQ ID NO: 17, SEQ ID NO: 18, or SEQ ID NO: 19. In certain embodiments, the antisense compound of the invention may comprise a modified oligonucleotide comprising a nucleobase sequence at least 90%, at least 95%, at least 96%, at least 97%, at least 98%, or at least 99% complementary to an equal length portion of a human sequence. In certain embodiments, the antisense compound of the invention may comprise a modified oligonucleotide comprising a nucleobase sequence at least 90%, at least 95%, at least 96%, at least 97%, at least 98%, or at least 99% complementary to an equal length portion of SEQ ID NO: 1, SEQ ID NO: 2, SEQ ID NO: 3, SEQ ID NO: 4, SEQ ID NO: 5, SEQ ID NO: 6, SEQ ID NO: 7, SEQ ID NO: 8, SEQ ID NO: 9, or SEQ ID NO: 10. In certain embodiments, the antisense compound of the invention may comprise a modified oligonucleotide comprising a nucleobase sequence 100% complementary to an equal length portion of SEQ ID NO: 1, SEQ ID NO: 2, SEQ ID NO: 3, SEQ ID NO: 4, SEQ ID NO: 5, SEQ ID NO: 6, SEQ ID NO: 7, SEQ ID NO: 8, SEQ ID NO: 9, SEQ ID NO: 10, SEQ ID NO: 11, SEQ ID NO: 12, SEQ ID NO: 13, SEQ ID NO: 14, SEQ ID NO: 15, SEQ ID NO: 16, SEQ ID NO: 17, SEQ ID NO: 18, or SEQ ID NO: 19. In certain embodiments, the antisense compound of the invention may comprise a modified oligonucleotide comprising a nucleobase sequence 100% complementary to an equal length portion of a human sequence. In certain embodiments, the antisense compound of the invention may comprise a modified oligonucleotide comprising a nucleobase sequence 100% complementary to an equal length portion of SEQ ID NO: 1, SEQ ID NO: 2, SEQ ID NO: 3, SEQ ID NO: 4, SEQ ID NO: 5, SEQ ID NO: 6, SEQ ID NO: 7, SEQ ID NO: 8, SEQ ID NO: 9, or SEQ ID NO: 10. In certain embodiments, the nucleobase sequence of the modified oligonucleotide is 100% complementary to a nucleobase sequence of SEQ ID NO: 1, SEQ ID NO: 2, SEQ ID NO: 3, SEQ ID NO: 4, SEQ ID NO: 5, SEQ ID NO: 6, SEQ ID NO: 7, SEQ ID NO: 8, SEQ ID NO: 9, or SEQ ID NO: 10. Certain embodiments of the disclosure provide methods comprising identifying an animal having a clotting disorder by administering to the animal a therapeutically effective amount of a compound comprising a modified oligonucleotide consisting of 12 to 30 linked nucleosides, wherein the modified oligonucleotide is complementary to a kallikrein nucleic acid. Certain embodiments of the disclosure provide methods comprising reducing the risk for thromboembolic conditions in an animal by administering to the animal a therapeutically effective amount of a compound comprising a modified oligonucleotide consisting of 12 to 30 linked nucleosides, wherein the modified oligonucleotide is complementary to a kallikrein nucleic acid. Certain embodiments of the disclosure provide methods comprising treating a clotting disorder in an animal by administering to the animal a therapeutically effective amount of a compound comprising a modified oligonucleotide consisting of 12 to 30 linked nucleosides, wherein the modified oligonucleotide is complementary to a kallikrein nucleic acid. Certain embodiments of the disclosure provide methods comprising inhibiting kallikrein expression in an animal by administering to the animal a therapeutically effective amount of a compound comprising a modified oligonucleotide consisting of 12 to 30 linked nucleosides, wherein the modified oligonucleotide is complementary to a kallikrein nucleic acid. In certain embodiments of the invention, the reduction of expression of KLKB1 mRNA in the animal is reversed by administering an antidote to the modified oligonucleotide. In certain embodiments, the antidote is an oligonucleotide complementary to the modified oligonucleotide. 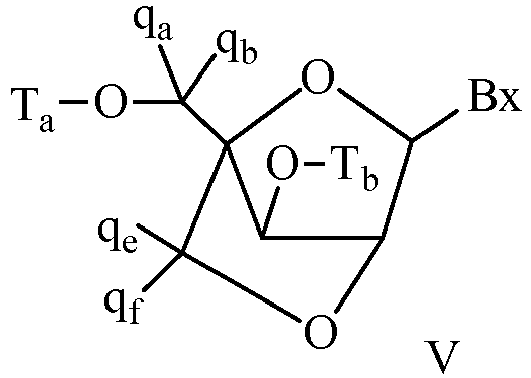 Certain embodiments of the disclosure provide for the use of a modified oligonucleotide consisting of 12 to 30 linked nucleosides, wherein the modified oligonucleotide is complementary to a kallikrein nucleic acid in the manufacture of a medicament for treating a thromboembolic condition. Certain embodiments of the disclosure provide methods comprising of inhibiting Factor 12 activation by inhibiting KLKB1 mRNA expression with a kallikrein specific inhibitor. The kallikrein specific inhibitor is an antisense compound. In certain embodiments, the antisense compound is a modified oligonucleotide consisting of 12 to 30 linked nucleosides, wherein the modified oligonucleotide is at least 90% complementary to a kallikrein nucleic acid. Oligomeric compounds include, but are not limited to, oligonucleotides, oligonucleosides, oligonucleotide analogs, oligonucleotide mimetics, antisense compounds, antisense oligonucleotides, and siRNAs. An oligomeric compound may be "antisense" to a target nucleic acid, meaning that is is capable of undergoing hybridization to a target nucleic acid through hydrogen bonding. In certain embodiments, an antisense compound has a nucleobase sequence that, when written in the 5' to 3' direction, comprises the reverse complement of the target segment of a target nucleic acid to which it is targeted. In certain such embodiments, an antisense oligonucleotide has a nucleobase sequence that, when written in the 5' to 3' direction, comprises the reverse complement of the target segment of a target nucleic acid to which it is targeted. In certain embodiments, an antisense compound targeted to a kallikrein nucleic acid is 12 to 30 subunits in length. In other words, such antisense compounds are from 12 to 30 linked subunits. In other embodiments, the antisense compound is 8 to 80, 12 to 50, 15 to 30, 18 to 24, 19 to 22, or 20 linked subunits. In certain such embodiments, the antisense compounds are 8, 9, 10, 11, 12, 13, 14, 15, 16, 17, 18, 19, 20, 21, 22, 23, 24, 25, 26, 27, 28, 29, 30, 31, 32, 33, 34, 35, 36, 37, 38, 39, 40, 41, 42, 43, 44, 45, 46, 47, 48, 49, 50, 51, 52, 53, 54, 55, 56, 57, 58, 59, 60, 61, 62, 63, 64, 65, 66, 67, 68, 69, 70, 71, 72, 73, 74, 75, 76, 77, 78, 79, or 80 linked subunits in length, or a range defined by any two of the above values. In some embodiments the antisense compound is an antisense oligonucleotide, and the linked subunits are nucleosides. 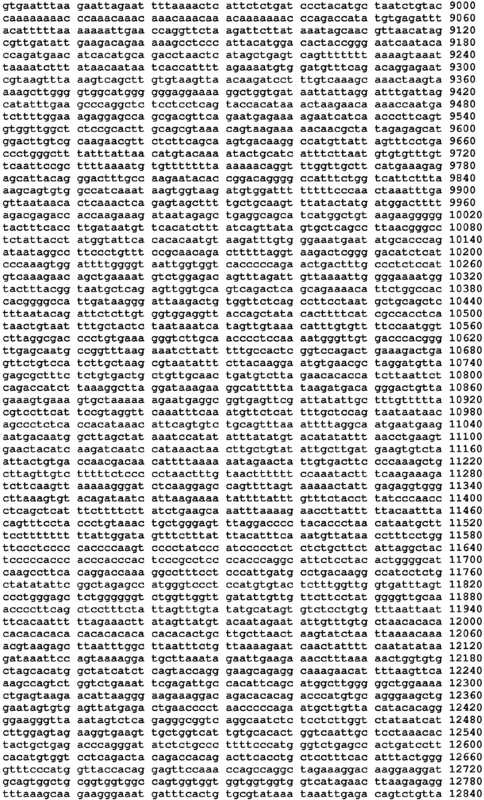 In certain embodiments antisense oligonucleotides targeted to a kallikrein nucleic acid may be shortened or truncated. For example, a single subunit may be deleted from the 5' end (5' truncation), or alternatively from the 3' end (3' truncation). A shortened or truncated antisense compound targeted to a kallikrein nucleic acid may have two subunits deleted from the 5' end, or alternatively may have two subunits deleted from the 3' end, of the antisense compound. Alternatively, the deleted nucleosides may be dispersed throughout the antisense compound, for example, in an antisense compound having one nucleoside deleted from the 5' end and one nucleoside deleted from the 3' end. When a single additional subunit is present in a lengthened antisense compound, the additional subunit may be located at the 5' or 3' end of the antisense compound. When two or more additional subunits are present, the added subunits may be adjacent to each other, for example, in an antisense compound having two subunits added to the 5' end (5' addition), or alternatively to the 3' end (3' addition), of the antisense compound. Alternatively, the added subunits may be dispersed throughout the antisense compound, for example, in an antisense compound having one subunit added to the 5' end and one subunit added to the 3' end. It is possible to increase or decrease the length of an antisense compound, such as an antisense oligonucleotide, and/or introduce mismatch bases without eliminating activity. For example, in Woolf et al. (Proc. Natl. Acad. Sci. USA 89:7305-7309, 1992), a series of antisense oligonucleotides 13-25 nucleobases in length were tested for their ability to induce cleavage of a target RNA in an oocyte injection model. Antisense oligonucleotides 25 nucleobases in length with 8 or 11 mismatch bases near the ends of the antisense oligonucleotides were able to direct specific cleavage of the target mRNA, albeit to a lesser extent than the antisense oligonucleotides that contained no mismatches. Similarly, target specific cleavage was achieved using 13 nucleobase antisense oligonucleotides, including those with 1 or 3 mismatches. Gautschi et al (J. Natl. Cancer Inst. 93:463-471, March 2001) demonstrated the ability of an oligonucleotide having 100% complementarity to the bcl-2 mRNA and having 3 mismatches to the bcl-xL mRNA to reduce the expression of both bcl-2 and bcl-xL in vitro and in vivo. Furthermore, this oligonucleotide demonstrated potent anti-tumor activity in vivo. Maher and Dolnick (Nuc. Acid. Res. 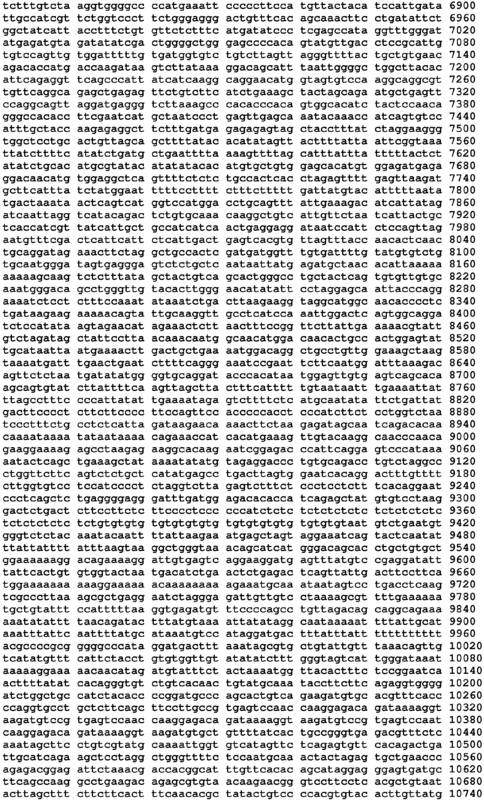 16:3341-3358,1988) tested a series of tandem 14 nucleobase antisense oligonucleotides, and a 28 and 42 nucleobase antisense oligonucleotides comprised of the sequence of two or three of the tandem antisense oligonucleotides, respectively, for their ability to arrest translation of human DHFR in a rabbit reticulocyte assay. Each of the three 14 nucleobase antisense oligonucleotides alone was able to inhibit translation, albeit at a more modest level than the 28 or 42 nucleobase antisense oligonucleotides. In certain embodiments, antisense compounds targeted to a kallikrein nucleic acid have chemically modified subunits arranged in patterns, or motifs, to confer to the antisense compounds properties such as enhanced the inhibitory activity, increased binding affinity for a target nucleic acid, or resistance to degradation by in vivo nucleases. Chimeric antisense compounds typically contain at least one region modified so as to confer increased resistance to nuclease degradation, increased cellular uptake, increased binding affinity for the target nucleic acid, and/or increased inhibitory activity. A second region of a chimeric antisense compound may optionally serve as a substrate for the cellular endonuclease RNase H, which cleaves the RNA strand of an RNA:DNA duplex. Antisense compounds having a gapmer motif are considered chimeric antisense compounds. In a gapmer an internal region having a plurality of nucleotides that supports RNaseH cleavage is positioned between external regions having a plurality of nucleotides that are chemically distinct from the nucleosides of the internal region. In the case of an antisense oligonucleotide having a gapmer motif, the gap segment generally serves as the substrate for endonuclease cleavage, while the wing segments comprise modified nucleosides. In certain embodiments, the regions of a gapmer are differentiated by the types of sugar moieties comprising each distinct region. 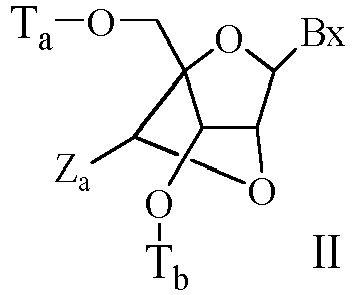 The types of sugar moieties that are used to differentiate the regions of a gapmer may in some embodiments include β-D-ribonucleosides, β-D-deoxyribonucleosides, 2'-modified nucleosides (such 2'-modified nucleosides may include 2'-MOE, and 2'-O-CH3, among others), and bicyclic sugar modified nucleosides (such bicyclic sugar modified nucleosides may include those having a 4'-(CH2)n-O-2' bridge, where n=1 or n=2). Preferably, each distinct region comprises uniform sugar moieties. The wing-gap-wing motif is frequently described as "X-Y-Z", where "X" represents the length of the 5' wing region, "Y" represents the length of the gap region, and "Z" represents the length of the 3' wing region. As used herein, a gapmer described as "X-Y-Z" has a configuration such that the gap segment is positioned immediately adjacent to each of the 5' wing segment and the 3' wing segment. Thus, no intervening nucleotides exist between the 5' wing segment and gap segment, or the gap segment and the 3' wing segment. Any of the antisense compounds described herein can have a gapmer motif. In some embodiments, X and Z are the same, in other embodiments they are different. In a preferred embodiment, Y is between 8 and 15 nucleotides. X, Y or Z can be any of 1, 2, 3, 4, 5, 6, 7, 8, 9, 10, 11, 12, 13, 14, 15, 16, 17, 18, 19, 20, 25, 30 or more nucleotides. Thus, gapmers include, but are not limited to, for example 5-10-5, 4-8-4, 4-12-3, 4-12-4, 3-14-3, 2-13-5, 2-16-2, 1-18-1, 3-10-3, 2-10-2, 1-10-1, 2-8-2, 5-8-5, or 6-8-6. In certain embodiments, the antisense compound has a "wingmer" motif, having a wing-gap or gap-wing configuration, i.e. an X-Y or Y-Z configuration as described above for the gapmer configuration. Thus, wingmer configurations include, but are not limited to, for example 5-10, 8-4, 4-12, 12-4, 3-14, 16-2, 18-1, 10-3, 2-10, 1-10, 8-2, 2-13, 5-13, 5-8, or 6-8. In certain embodiments, antisense compounds targeted to a kallikrein nucleic acid possess a 5-10-5 gapmer motif. 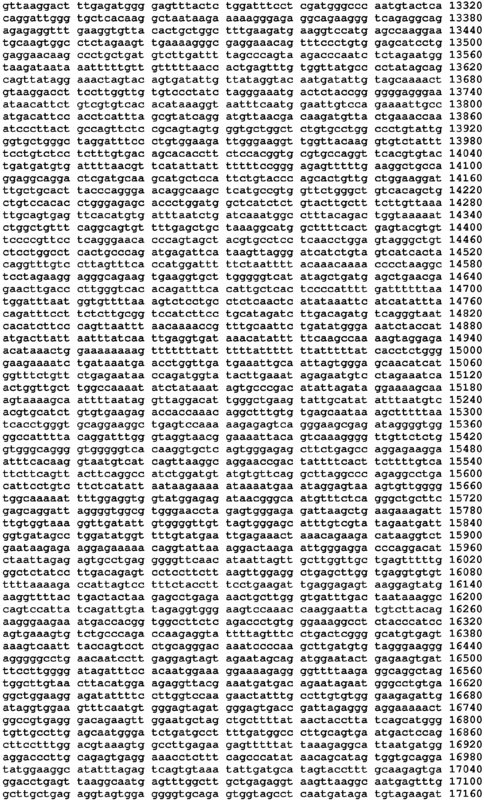 In certain embodiments, antisense compounds targeted to a kallikrein nucleic acid possess a 3-14-3 gapmer motif. In certain embodiments, antisense compounds targeted to a kallikrein nucleic acid possess a 2-13-5 gapmer motif. In certain embodiments, antisense compounds targeted to a kallikrein nucleic acid possess a 5-8-5 gapmer motif. 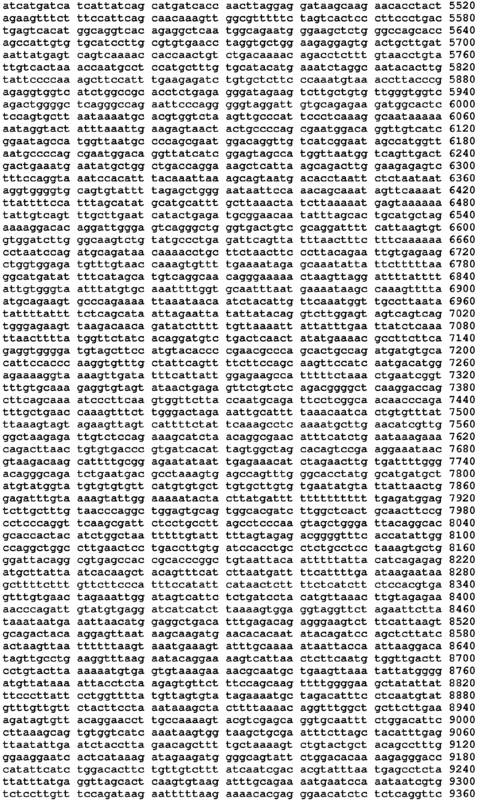 In certain embodiments, antisense compounds targeted to a kallikrein nucleic acid possess a 6-8-6 gapmer motif. In certain embodiments, an antisense compound targeted to a kallikrein nucleic acid has a gap-widened motif. In certain embodiments, a gap-widened antisense oligonucleotide targeted to a kallikrein nucleic acid has a gap segment of fourteen 2'-deoxyribonucleotides positioned immediately adjacent to and between wing segments of three chemically modified nucleosides. In certain embodiments, the chemical modification comprises a 2'-sugar modification. In another embodiment, the chemical modification comprises a 2'-MOE sugar modification. In certain embodiments, a gap-widened antisense oligonucleotide targeted to a kallikrein nucleic acid has a gap segment of thirteen 2'-deoxyribonucleotides positioned immediately adjacent to and between a 5' wing segment of two chemically modified nucleosides and a 3' wing segment of five chemically modified nucleosides. In certain embodiments, the chemical modification comprises a 2'-sugar modification. In another embodiment, the chemical modification comprises a 2'-MOE sugar modification. 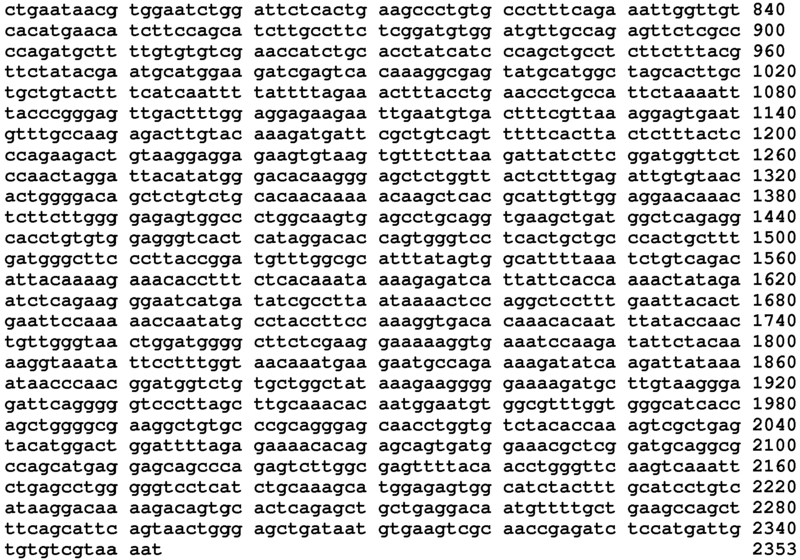 Nucleotide sequences that encode kallikrein include, without limitation, the following: GENBANK Accession No. 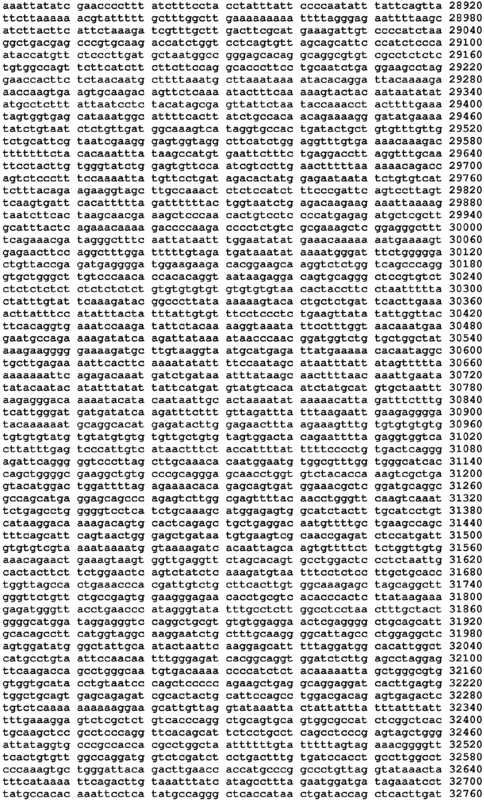 NM_000892.3 (incorporated herein as SEQ ID NO: 1), GENBANK Accession No. 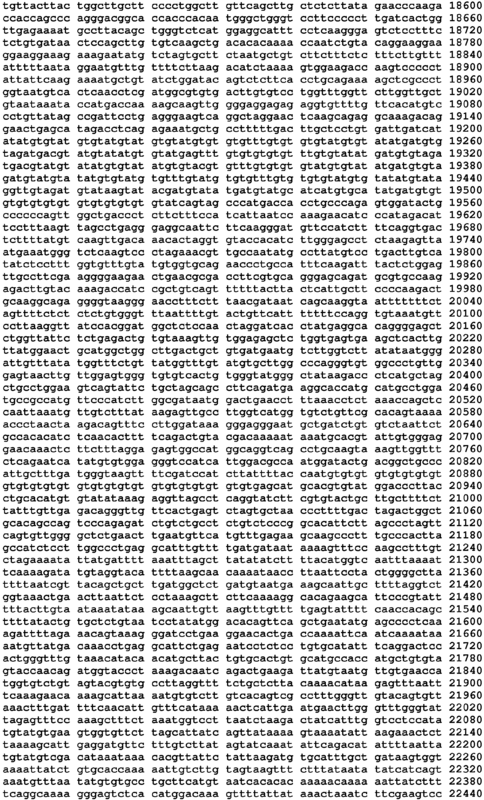 DC412984.1 (incorporated herein as SEQ ID NO: 2), GENBANK Accession No. 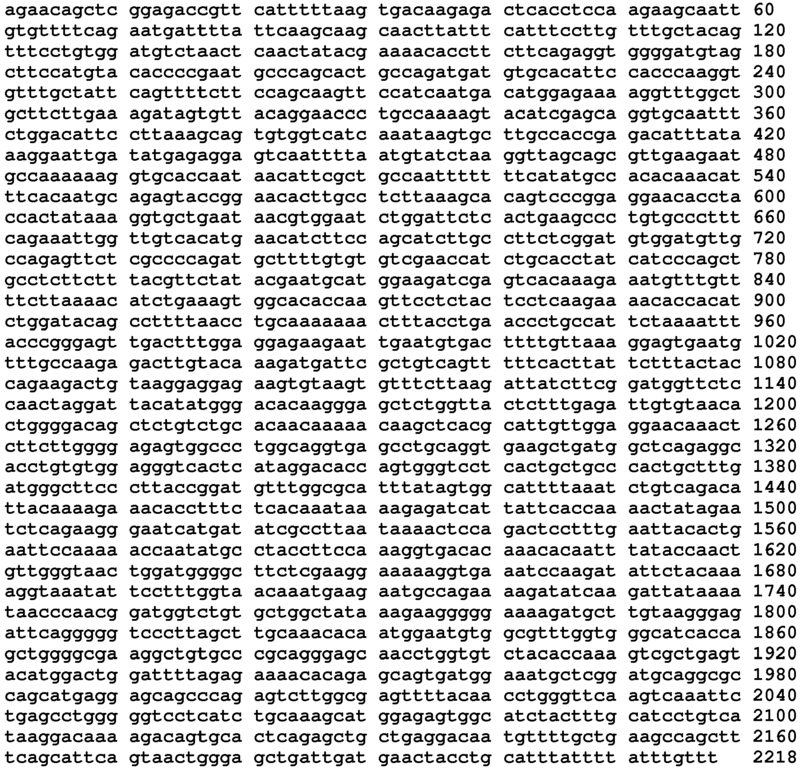 CN265612.1 (incorporated herein as SEQ ID NO: 3), GENBANK Accession No. 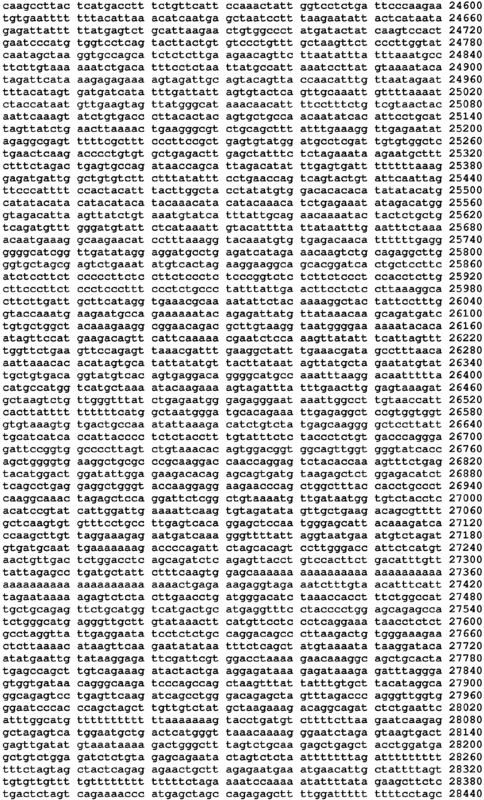 AK297672.1 (incorporated herein as SEQ ID NO: 4), GENBANK Accession No. 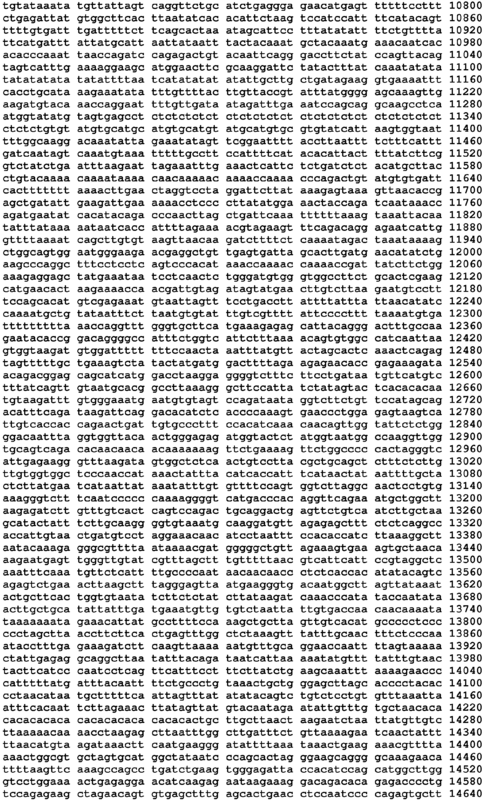 DC413312.1 (incorporated herein as SEQ ID NO: 5), GENBANK Accession No. 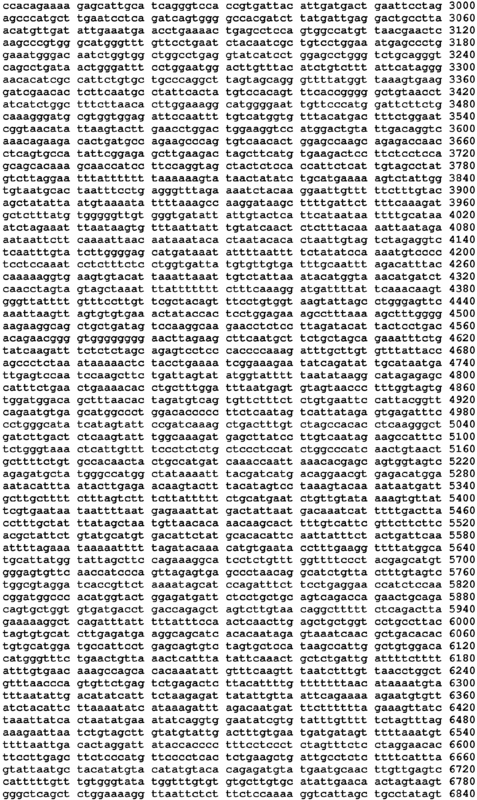 AV688858.2 (incorporated herein as SEQ ID NO: 6), GENBANK Accession No. 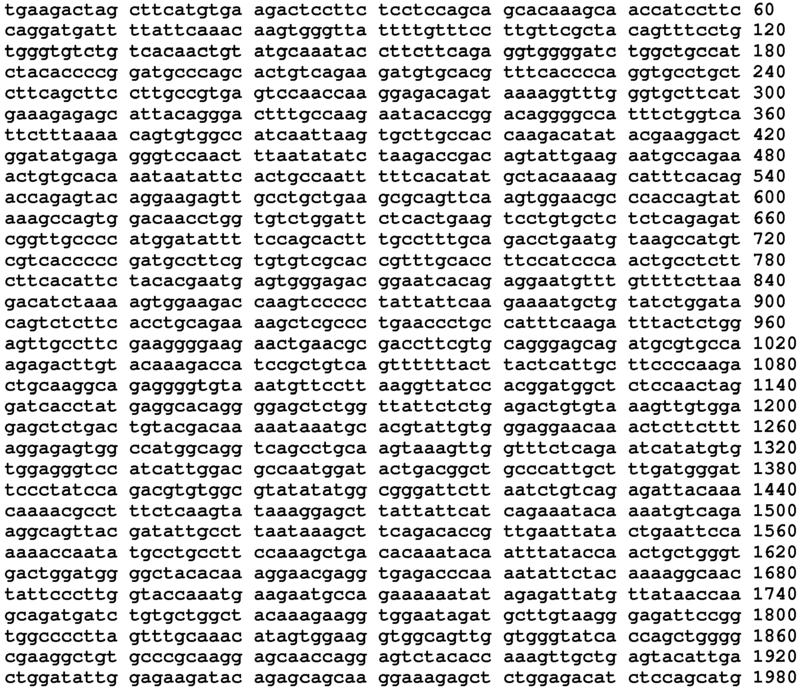 CD652077.1 (incorporated herein as SEQ ID NO: 7), GENBANK Accession No. 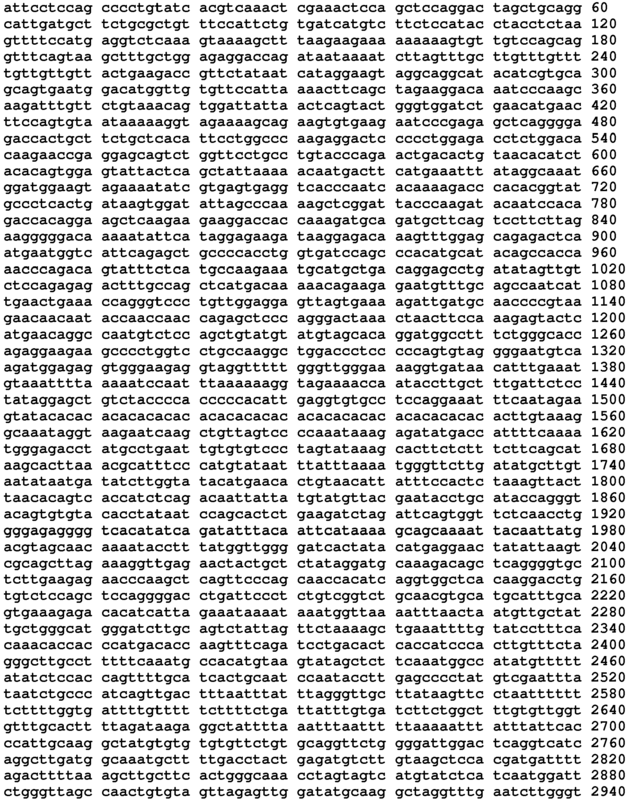 BC143911.1 (incorporated herein as SEQ ID NO: 8), GENBANK Accession No. 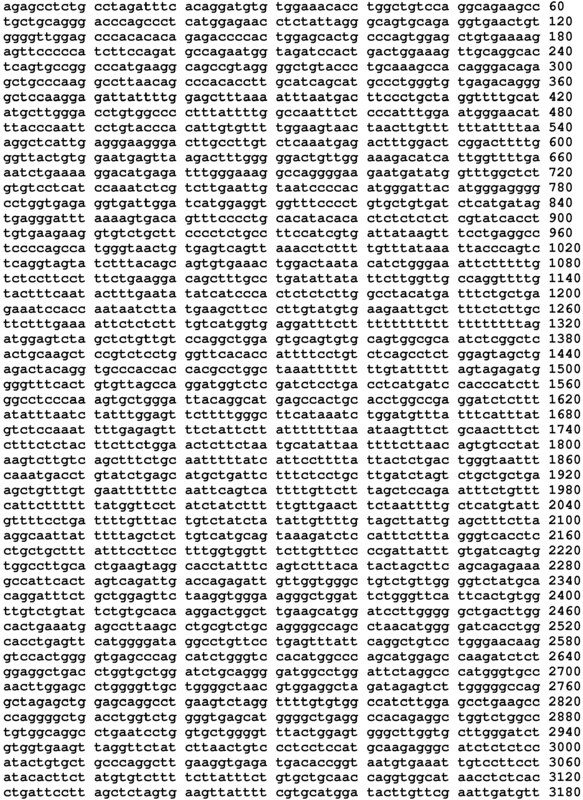 CB 162532.1 (incorporated herein as SEQ ID NO: 9), GENBANK Accession No. 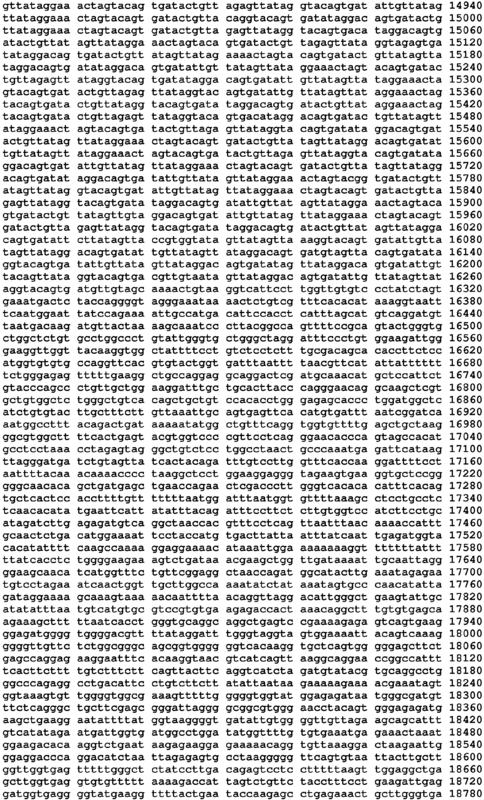 NT_016354.19 truncated from nucleobases 111693001 to 111730000 (incorporated herein as SEQ ID NO: 10), GENBANK Accession No. 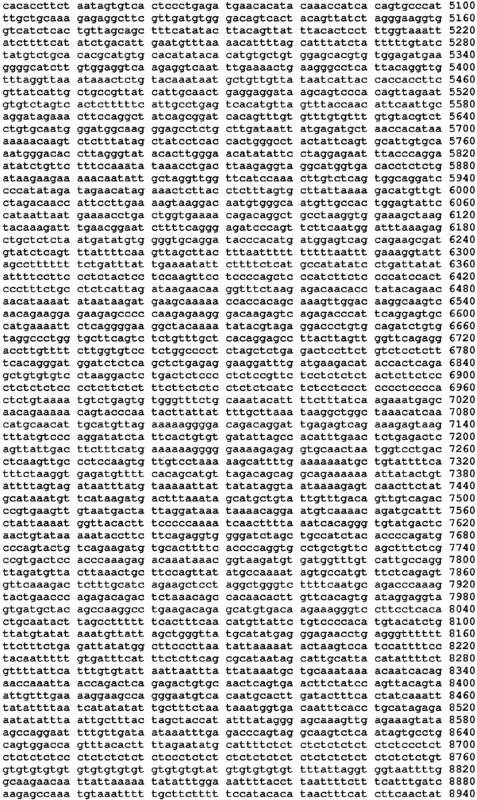 NM_008455.2 (incorporated herein as SEQ ID NO: 11), GENBANK Accession No. BB598673.1 (incorporated herein as SEQ ID NO: 12), the complement of GENBANK Accession No. 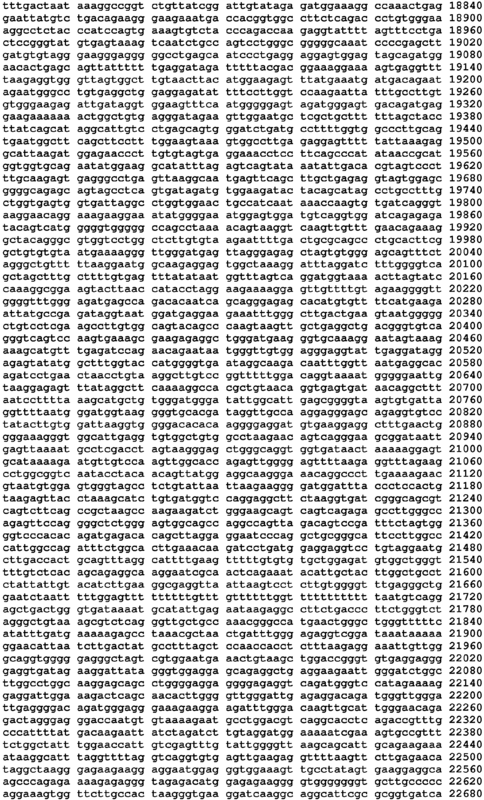 NT_039460.7 truncated from nucleobases 6114001 to 6144000 (incorporated herein as SEQ ID NO: 13), GENBANK Accession No. 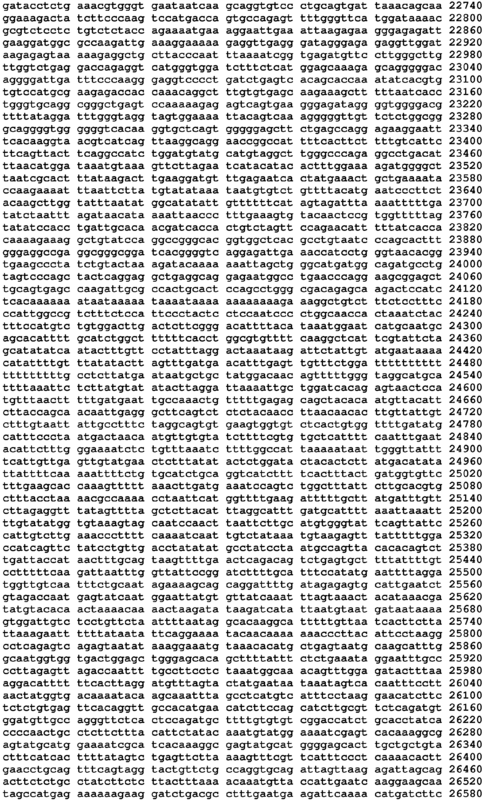 NM_012725.2 (incorporated herein as SEQ ID NO: 14), GENBANK Accession No. 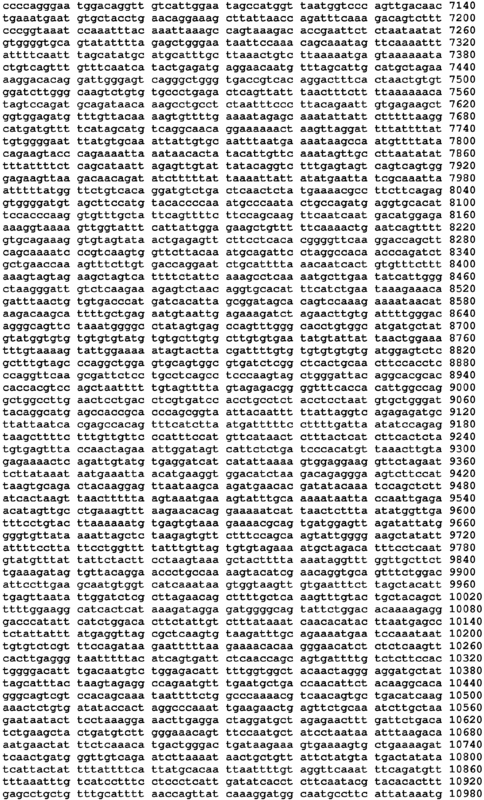 NW_047473.1 truncated from nucleobases 10952001 to 10982000 (incorporated herein as SEQ ID NO: 15), exons 1-7 and 9-15 cut from the rhesus genomic sequence GENBANK Accession No. 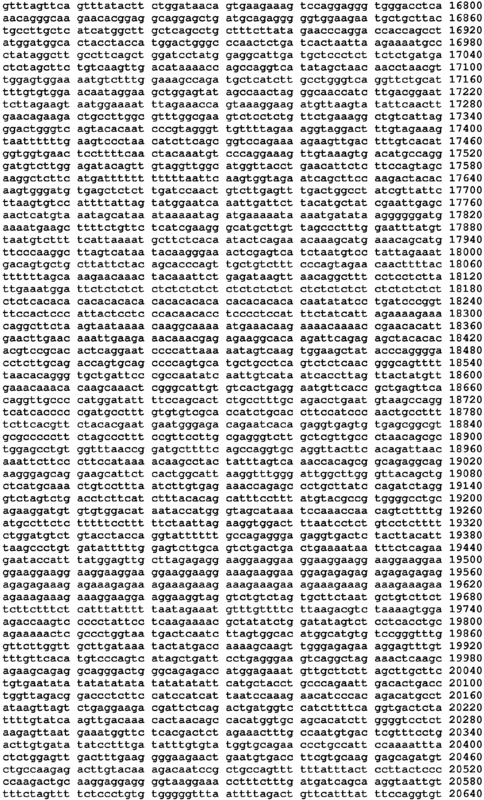 NW_001118167.1 based on similarity to human exons and where rhesus exon 8 has been replaced with N (110) (incorporated herein as SEQ ID NO: 16), GENBANK Accession No. 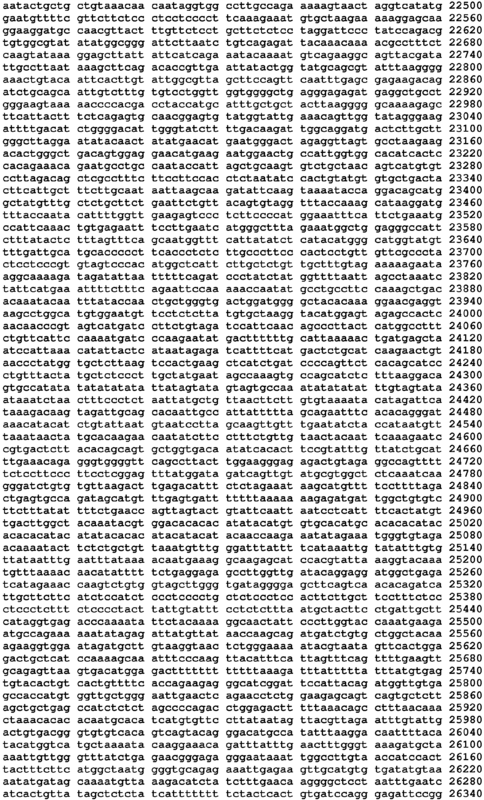 XM_002804276.1 (incorporated herein as SEQ ID NO: 17), GENBANK Accession No. 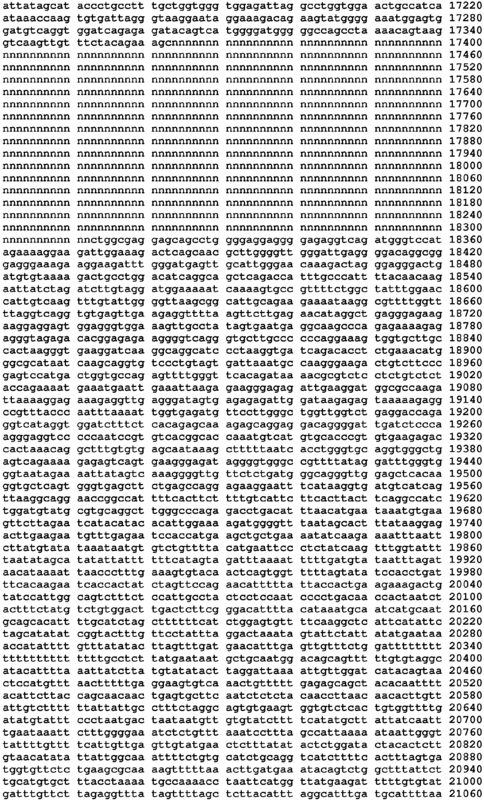 NW_001118167.1 truncated from nucleobases 2358000 to 2391000 (incorporated herein as SEQ ID NO: 18), and exons 1-15 assembled from trace archive of baboon based on homology to human (incorporated herein as SEQ ID NO: 19). It is understood that the sequence set forth in each SEQ ID NO in the Examples contained herein is independent of any modification to a sugar moiety, an internucleoside linkage, or a nucleobase. As such, antisense compounds defined by a SEQ ID NO may comprise, independently, one or more modifications to a sugar moiety, an internucleoside linkage, or a nucleobase. Antisense compounds described by Isis Number (Isis No) indicate a combination of nucleobase sequence and motif. In certain embodiments, a target region is a structurally defined region of the target nucleic acid. For example, a target region may encompass a 3' UTR, a 5' UTR, an exon, an intron, an exon/intron junction, a coding region, a translation initiation region, translation termination region, or other defined nucleic acid region. 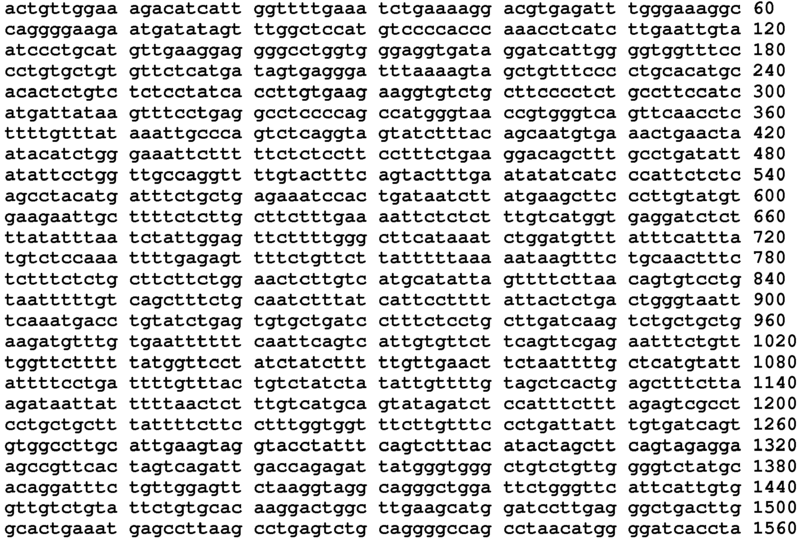 The structurally defined regions for kallikrein can be obtained by accession number from sequence databases such as NCBI. In certain embodiments, a target region may encompass the sequence from a 5' target site of one target segment within the target region to a 3' target site of another target segment within the same target region. Targeting includes determination of at least one target segment to which an antisense compound hybridizes, such that a desired effect occurs. In certain embodiments, the desired effect is a reduction in mRNA target nucleic acid levels. In certain embodiments, the desired effect is reduction of levels of protein encoded by the target nucleic acid or a phenotypic change associated with the target nucleic acid. A target region may contain one or more target segments. Multiple target segments within a target region may be overlapping. Alternatively, they may be non-overlapping. In certain embodiments, target segments within a target region are separated by no more than about 300 nucleotides. In certain emodiments, target segments within a target region are separated by a number of nucleotides that is, is about, is no more than, is no more than about, 250, 200, 150, 100, 90, 80, 70, 60, 50, 40, 30, 20, or 10 nucleotides on the target nucleic acid, or is a range defined by any two of the preceeding values. In certain embodiments, target segments within a target region are separated by no more than, or no more than about, 5 nucleotides on the target nucleic acid. In certain embodiments, target segments are contiguous. Contemplated are target regions defined by a range having a starting nucleic acid that is any of the 5' target sites or 3' target sites listed herein. Suitable target segments may be found within a 5' UTR, a coding region, a 3' UTR, an intron, an exon, or an exon/intron junction. Target segments containing a start codon or a stop codon are also suitable target segments. A suitable target segment may specifcally exclude a certain structurally defined region such as the start codon or stop codon. 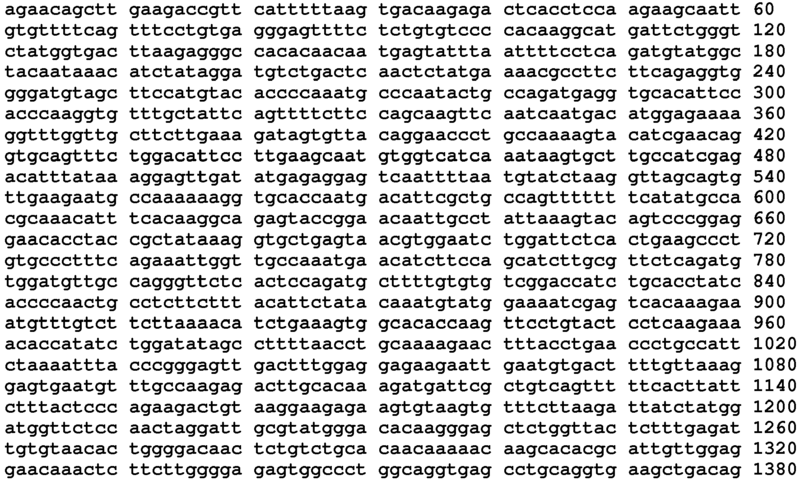 The determination of suitable target segments may include a comparison of the sequence of a target nucleic acid to other sequences throughout the genome. For example, the BLAST algorithm may be used to identify regions of similarity amongst different nucleic acids. This comparison can prevent the selection of antisense compound sequences that may hybridize in a non-specific manner to sequences other than a selected target nucleic acid (i.e., non-target or off-target sequences). There may be variation in activity (e.g., as defined by percent reduction of target nucleic acid levels) of the antisense compounds within an active target region. In certain embodiments, reductions in kallikrein mRNA levels are indicative of inhibition of kallikrein expression. Reductions in levels of a kallikrein protein are also indicative of inhibition of target mRNA expression. Further, phenotypic changes are indicative of inhibition of kallikrein expression. For example, a prolonged aPTT time can be indicative of inhibition of kallikrein expression. In another example, prolonged aPTT time in conjunction with a normal PT time can be indicative of inhibition of kallikrein expression. In another example, a decreased quantity of Platelet Factor 4 (PF-4) can be indicative of inhibition of kallikrein expression. In another example, reduced formation of thrombus or increased time for thrombus formation can be indicative of inhibition of kallikrein expression. In some embodiments, hybridization occurs between an antisense compound disclosed herein and a kallikrein nucleic acid. The most common mechanism of hybridization involves hydrogen bonding (e.g., Watson-Crick, Hoogsteen or reversed Hoogsteen hydrogen bonding) between complementary nucleobases of the nucleic acid molecules. Hybridization can occur under varying conditions. Stringent conditions are sequence-dependent and are determined by the nature and composition of the nucleic acid molecules to be hybridized. 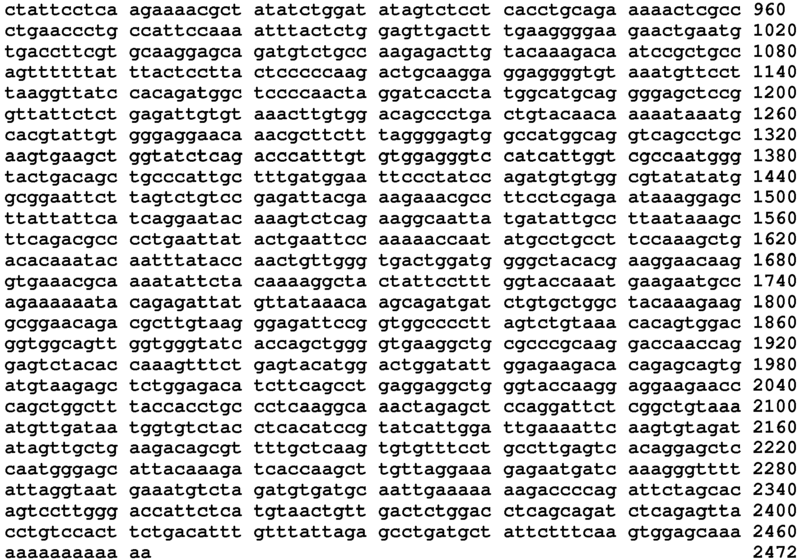 Methods of determining whether a sequence is specifically hybridizable to a target nucleic acid are well known in the art. In certain embodiments, the antisense compounds provided herein are specifically hybridizable with a kallikrein nucleic acid. An antisense compound and a target nucleic acid are complementary to each other when a sufficient number of nucleobases of the antisense compound can hydrogen bond with the corresponding nucleobases of the target nucleic acid, such that a desired effect will occur (e.g., antisense inhibition of a target nucleic acid, such as a kallikrein nucleic acid). Non-complementary nucleobases between an antisense compound and a kallikrein nucleic acid may be tolerated provided that the antisense compound remains able to specifically hybridize to a target nucleic acid. Moreover, an antisense compound may hybridize over one or more segments of a kallikrein nucleic acid such that intervening or adjacent segments are not involved in the hybridization event (e.g., a loop structure, mismatch or hairpin structure). In certain embodiments, the antisense compounds provided herein, or a specified portion thereof, are, or are at least 90%, 91%, 92%, 93%, 94%, 95%, 96%, 97%, 98%, 99%, or 100% complementary to a kallikrein nucleic acid, a target region, target segment, or specified portion thereof. Percent complementarity of an antisense compound with a target nucleic acid can be determined using routine methods. For example, an antisense compound in which 18 of 20 nucleobases of the antisense compound are complementary to a target region, and would therefore specifically hybridize, would represent 90 percent complementarity. In this example, the remaining noncomplementary nucleobases may be clustered or interspersed with complementary nucleobases and need not be contiguous to each other or to complementary nucleobases. As such, an antisense compound which is 18 nucleobases in length having 4 (four) noncomplementary nucleobases which are flanked by two regions of complete complementarity with the target nucleic acid would have 77.8% overall complementarity with the target nucleic acid. Percent complementarity of an antisense compound with a region of a target nucleic acid can be determined routinely using BLAST programs (basic local alignment search tools) and PowerBLAST programs known in the art (Altschul et al., J. Mol. Biol., 1990, 215, 403 410; Zhang and Madden, Genome Res., 1997, 7, 649 656). Percent homology, sequence identity or complementarity, can be determined by, for example, the Gap program (Wisconsin Sequence Analysis Package, Version 8 for Unix, Genetics Computer Group, University Research Park, Madison Wis.), using default settings, which uses the algorithm of Smith and Waterman (Adv. Appl. Math., 1981, 2, 482 489). In certain embodiments, the antisense compounds provided herein, or specified portions thereof, are fully complementary (i.e. 100% complementary) to a target nucleic acid, or specified portion thereof. For example, an antisense compound may be fully complementary to a kallikrein nucleic acid, or a target region, or a target segment or target sequence thereof. As used herein, "fully complementary" means each nucleobase of an antisense compound is capable of precise base pairing with the corresponding nucleobases of a target nucleic acid. For example, a 20 nucleobase antisense compound is fully complementary to a target sequence that is 400 nucleobases long, so long as there is a corresponding 20 nucleobase portion of the target nucleic acid that is fully complementary to the antisense compound. Fully complementary can also be used in reference to a specified portion of the first and /or the second nucleic acid. For example, a 20 nucleobase portion of a 30 nucleobase antisense compound can be "fully complementary" to a target sequence that is 400 nucleobases long. The 20 nucleobase portion of the 30 nucleobase oligonucleotide is fully complementary to the target sequence if the target sequence has a corresponding 20 nucleobase portion wherein each nucleobase is complementary to the 20 nucleobase portion of the antisense compound. At the same time, the entire 30 nucleobase antisense compound may or may not be fully complementary to the target sequence, depending on whether the remaining 10 nucleobases of the antisense compound are also complementary to the target sequence. The location of a non-complementary nucleobase may be at the 5' end or 3' end of the antisense compound. Alternatively, the non-complementary nucleobase or nucleobases may be at an internal position of the antisense compound. When two or more non-complementary nucleobases are present, they may be contiguous (i.e. linked) or non-contiguous. In one embodiment, a non-complementary nucleobase is located in the wing segment of a gapmer antisense oligonucleotide. In certain embodiments, antisense compounds that are, or are up to 12, 13, 14, 15, 16, 17, 18, 19, or 20 nucleobases in length comprise no more than 4, no more than 3, no more than 2, or no more than 1 non-complementary nucleobase(s) relative to a target nucleic acid, such as a kallikrein nucleic acid, or specified portion thereof. In certain embodiments, antisense compounds that are, or are up to 12, 13, 14, 15, 16, 17, 18, 19, 20, 21, 22, 23, 24, 25, 26, 27, 28, 29, or 30 nucleobases in length comprise no more than 6, no more than 5, no more than 4, no more than 3, no more than 2, or no more than 1 non-complementary nucleobase(s) relative to a target nucleic acid, such as a kallikrein nucleic acid, or specified portion thereof. The antisense compounds provided herein also include those which are complementary to a portion of a target nucleic acid. As used herein, "portion" refers to a defined number of contiguous (i.e. linked) nucleobases within a region or segment of a target nucleic acid. A "portion" can also refer to a defined number of contiguous nucleobases of an antisense compound. In certain embodiments, the antisense compounds, are complementary to at least an 8 nucleobase portion of a target segment. In certain embodiments, the antisense compounds are complementary to at least a 12 nucleobase portion of a target segment. In certain embodiments, the antisense compounds are complementary to at least a 15 nucleobase portion of a target segment. Also contemplated are antisense compounds that are complementary to at least a 9, 10, 11, 12, 13, 14, 15, 16, 17, 18, 19, 20, or more nucleobase portion of a target segment, or a range defined by any two of these values. The antisense compounds provided herein may also have a defined percent identity to a particular nucleotide sequence, SEQ ID NO, or compound represented by a specific Isis number, or portion thereof. As used herein, an antisense compound is identical to the sequence disclosed herein if it has the same nucleobase pairing ability. For example, a RNA which contains uracil in place of thymidine in a disclosed DNA sequence would be considered identical to the DNA sequence since both uracil and thymidine pair with adenine. Shortened and lengthened versions of the antisense compounds described herein as well as compounds having non-identical bases relative to the antisense compounds provided herein also are contemplated. The non-identical bases may be adjacent to each other or dispersed throughout the antisense compound. Percent identity of an antisense compound is calculated according to the number of bases that have identical base pairing relative to the sequence to which it is being compared. In certain embodiments, the antisense compounds, or portions thereof, are at least 90%, 95%, 96%, 97%, 98%, 99% or 100% identical to one or more of the antisense compounds or SEQ ID NOs, or a portion thereof, disclosed herein. In certain embodiments, a portion of the antisense compound is compared to an equal length portion of the target nucleic acid. In certain embodiments, an 8, 9, 10, 11, 12, 13, 14, 15, 16, 17, 18, 19, 20, 21, 22, 23, 24, or 25 nucleobase portion is compared to an equal length portion of the target nucleic acid. In certain embodiments, a portion of the antisense oligonucleotide is compared to an equal length portion of the target nucleic acid. In certain embodiments, an 8, 9, 10, 11, 12, 13, 14, 15, 16, 17, 18, 19, 20, 21, 22, 23, 24, or 25 nucleobase portion is compared to an equal length portion of the target nucleic acid. A nucleoside is a base-sugar combination. The nucleobase (also known as base) portion of the nucleoside is normally a heterocyclic base moiety. Nucleotides are nucleosides that further include a phosphate group covalently linked to the sugar portion of the nucleoside. For those nucleosides that include a pentofuranosyl sugar, the phosphate group can be linked to the 2', 3' or 5' hydroxyl moiety of the sugar. Oligonucleotides are formed through the covalent linkage of adjacent nucleosides to one another, to form a linear polymeric oligonucleotide. Within the oligonucleotide structure, the phosphate groups are commonly referred to as forming the internucleoside linkages of the oligonucleotide. Modifications to antisense compounds encompass substitutions or changes to internucleoside linkages, sugar moieties, or nucleobases. Modified antisense compounds are often preferred over native forms because of desirable properties such as, for example, enhanced cellular uptake, enhanced affinity for nucleic acid target, increased stability in the presence of nucleases, or increased inhibitory activity. Chemically modified nucleosides may also be employed to increase the binding affinity of a shortened or truncated antisense oligonucleotide for its target nucleic acid. Consequently, comparable results can often be obtained with shorter antisense compounds that have such chemically modified nucleosides. The naturally occuring internucleoside linkage of RNA and DNA is a 3' to 5' phosphodiester linkage. Antisense compounds having one or more modified, i.e. non-naturally occurring, internucleoside linkages are often selected over antisense compounds having naturally occurring internucleoside linkages because of desirable properties such as, for example, enhanced cellular uptake, enhanced affinity for target nucleic acids, and increased stability in the presence of nucleases. Oligonucleotides having modified internucleoside linkages include internucleoside linkages that retain a phosphorus atom as well as internucleoside linkages that do not have a phosphorus atom. Representative phosphorus containing internucleoside linkages include, but are not limited to, phosphodiesters, phosphotriesters, methylphosphonates, phosphoramidate, and phosphorothioates. Methods of preparation of phosphorous-containing and non-phosphorous-containing linkages are well known. In certain embodiments, antisense compounds targeted to a kallikrein nucleic acid comprise one or more modified internucleoside linkages. In certain embodiments, the modified internucleoside linkages are phosphorothioate linkages. In certain embodiments, each internucleoside linkage of an antisense compound is a phosphorothioate internucleoside linkage. Antisense compounds of the invention can optionally contain one or more nucleosides wherein the sugar group has been modified. Such sugar modified nucleosides may impart enhanced nuclease stability, increased binding affinity, or some other beneficial biological property to the antisense compounds. In certain embodiments, nucleosides comprise chemically modified ribofuranose ring moieties. Examples of chemically modified ribofuranose rings include without limitation, addition of substitutent groups (including 5' and 2' substituent groups, bridging of non-geminal ring atoms to form bicyclic nucleic acids (BNA), replacement of the ribosyl ring oxygen atom with S, N(R), or C(R1)(R2) (R, R1 and R2 are each independently H, C1-C12 alkyl or a protecting group) and combinations thereof. Examples of chemically modified sugars include 2'-F-5'-methyl substituted nucleoside (see PCT International Application WO 2008/101157 Published on 8/21/08 for other disclosed 5',2'-bis substituted nucleosides) or replacement of the ribosyl ring oxygen atom with S with further substitution at the 2'-position (see published U.S. Patent Application US2005-0130923, published on June 16, 2005 ) or alternatively 5'-substitution of a BNA (see PCT International Application WO 2007/134181 Published on 11/22/07 wherein LNA is substituted with for example a 5'-methyl or a 5'-vinyl group). Examples of nucleosides having modified sugar moieties include without limitation nucleosides comprising 5'-vinyl, 5'-methyl (R or S), 4'-S, 2'-F, 2'-OCH3, 2'-OCH2CH3, 2'-OCH2CH2F and 2'-O(CH2)2OCH3 substituent groups. The substituent at the 2' position can also be selected from allyl, amino, azido, thio, O-allyl, O-C1-C10 alkyl, OCF3, OCH2F, O(CH2)2SCH3, O(CH2)2-O-N(Rm)(Rn), O-CH2-C(=O)-N(Rm)(Rn), and O-CH2-C(=O)-N(R1)-(CH2)2-N(Rm)(Rn), where each Rl, Rm and Rn is, independently, H or substituted or unsubstituted C1-C10 alkyl. As used herein, "bicyclic nucleosides" refer to modified nucleosides comprising a bicyclic sugar moiety. Examples of bicyclic nucleosides include without limitation nucleosides comprising a bridge between the 4' and the 2' ribosyl ring atoms. In certain embodiments, antisense compounds provided herein include one or more bicyclic nucleosides comprising a 4' to 2' bridge. Examples of such 4' to 2' bridged bicyclic nucleosides, include but are not limited to one of the formulae: 4'-(CH2)-O-2' (LNA); 4'-(CH2)-S-2'; 4'-(CH2)2-O-2' (ENA); 4'-CH(CH3)-O-2' (also referred to as constrained ethyl of cEt) and 4'-CH(CH2OCH3)-O-2' (and analogs thereof see U.S. Patent 7,399,845, issued on July 15, 2008 ); 4'-C(CH3)(CH3)-O-2' (and analogs thereof see published International Application WO/2009/006478, published January 8, 2009 ); 4'-CH2-N(OCH3)-2' (and analogs thereof see published International Application WO/2008/150729, published December 11, 2008 ); 4'-CH2-O-N(CH3)-2' (see published U.S. Patent Application US2004-0171570, published September 2, 2004 ); 4'-CH2-N(R)-O-2', wherein R is H, C1-C12 alkyl, or a protecting group (see U.S. Patent 7,427,672, issued on September 23, 2008 ); 4'-CH2-C(H)(CH3)-2' (see Chattopadhyaya et al., J. Org. Chem., 2009, 74, 118-134); and 4'-CH2-C(=CH2)-2' (and analogs thereof see published International Application WO 2008/154401, published on December 8, 2008 ). Further reports related to bicyclic nucleosides can also be found in published literature (see for example: Singh et al., Chem. Commun., 1998, 4, 455-456; Koshkin et al., Tetrahedron, 1998, 54, 3607-3630; Wahlestedt et al., Proc. Natl. Acad. Sci. U. S. A., 2000, 97, 5633-5638; Kumar et al., Bioorg. Med. Chem. Lett., 1998, 8, 2219-2222; Singh et al., J. Org. 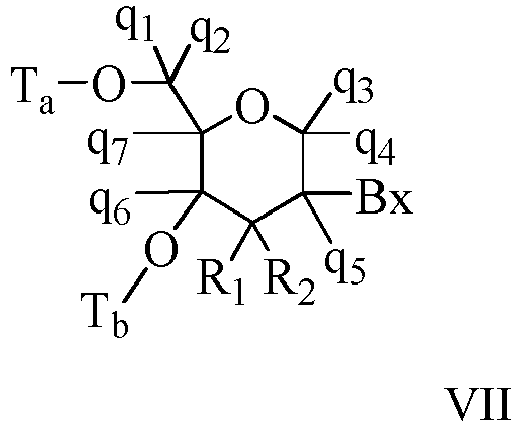 Chem., 1998, 63, 10035-10039; Srivastava et al., J. Am. Chem. Soc., 2007, 129(26) 8362-8379; Elayadi et al., Curr. Opinion Invest. Drugs, 2001, 2, 558-561; Braasch et al., Chem. Biol., 2001, 8, 1-7; and Orum et al., Curr. Opinion Mol. Ther., 2001, 3, 239-243; U.S. Patent Nos. 6,268,490 ; 6,525,191 ; 6,670,461 ; 6,770,748 ; 6,794,499 ; 7,034,133 ; 7,053,207 ; 7,399,845 ; 7,547,684 ; and 7,696,345 ; U.S. Patent Publication No. US2008-0039618 ; US2009-0012281 ; U.S. Patent Serial Nos. 60/989,574 ; 61/026,995 ; 61/026,998 ; 61/056,564 ; 61/086,231 ; 61/097,787 ; and 61/099,844 ; Published PCT International applications WO 1994/014226 ; WO 2004/106356 ; WO 2005/021570 ; WO 2007/134181 ; WO 2008/150729 ; WO 2008/154401 ; and WO 2009/006478 . Each of the foregoing bicyclic nucleosides can be prepared having one or more stereochemical sugar configurations including for example α-L-ribofuranose and β-D-ribofuranose (see PCT international application PCT/DK98/00393, published on March 25, 1999 as WO 99/14226 ). each J1 and J2 is, independently, H, C1-C12 alkyl, substituted C1-C12 alkyl, C2-C12 alkenyl, substituted C2-C12 alkenyl, C2-C12 alkynyl, substituted C2-C12 alkynyl, C5-C20 aryl, substituted C5-C20 aryl, acyl (C(=O)-H), substituted acyl, a heterocycle radical, a substituted heterocycle radical, C1-C12 aminoalkyl, substituted C1-C12 aminoalkyl or a protecting group. In certain embodiments, the bridge of a bicyclic sugar moiety is -[C(Ra)(Rb)]n-, -[C(Ra)(Rb)]n-O-, -C(RaRb)-N(R)-O- or -C(RaRb)-O-N(R)-. In certain embodiments, the bridge is 4'-CH2-2', 4'-(CH2)2-2', 4'-(CH2)3-2', 4'-CH2-O-2', 4'-(CH2)2-O-2', 4'-CH2-O-N(R)-2' and 4'-CH2-N(R)-O-2'- wherein each R is, independently, H, a protecting group or C1-C12 alkyl. In certain embodiments, bicyclic nucleosides are further defined by isomeric configuration. For example, a nucleoside comprising a 4'-2' methylene-oxy bridge, may be in the α-L configuration or in the β-D configuration. Previously, α-L-methyleneoxy (4'-CH2-O-2') BNA's have been incorporated into antisense oligonucleotides that showed antisense activity (Frieden et al., Nucleic Acids Research, 2003, 21, 6365-6372). In certain embodiments, bicyclic nucleosides include, but are not limited to, (A) α-L-methyleneoxy (4'-CH2-O-2') BNA, (B) β-D-methyleneoxy (4'-CH2-O-2') BNA, (C) ethyleneoxy (4'-(CH2)2-O-2') BNA, (D) aminooxy (4'-CH2-O-N(R)-2') BNA, (E) oxyamino (4'-CH2-N(R)-O-2') BNA, and (F) methyl(methyleneoxy) (4'-CH(CH3)-O-2') BNA, (G) methylene-thio (4'-CH2-S-2') BNA, (H) methylene-amino (4'-CH2-N(R)-2') BNA, (I) methyl carbocyclic (4'-CH2-CH(CH3)-2') BNA, (J) propylene carbocyclic (4'-(CH2)3-2') BNA, and (K) vinyl BNA, as depicted below. wherein Bx is the base moiety and R is independently H, a protecting group, C1-C12 alkyl, or C1-C12 alkoxy. 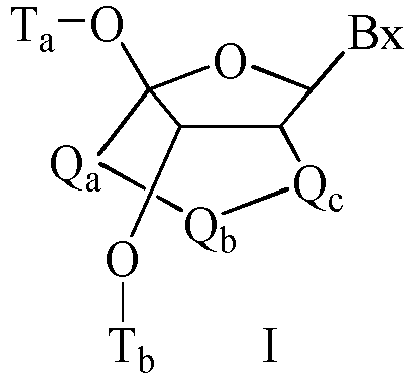 Ta and Tb are each, independently H, a hydroxyl protecting group, a conjugate group, a reactive phosphorus group, a phosphorus moiety or a covalent attachment to a support medium. Za is C1-C6 alkyl, C2-C6 alkenyl, C2-C6 alkynyl, substituted C1-C6 alkyl, substituted C2-C6 alkenyl, substituted C2-C6 alkynyl, acyl, substituted acyl, substituted amide, thiol or substituted thio. In one embodiment, each of the substituted groups is, independently, mono or poly substituted with substituent groups independently selected from halogen, oxo, hydroxyl, OJc, NJcJd, SJc, N3, OC(=X)Jc, and NJeC(=X)NJcJd, wherein each Jc, Jd and Je is, independently, H, C1-C6 alkyl, or substituted C1-C6 alkyl and X is O or NJc. Zb is C1-C6 alkyl, C2-C6 alkenyl, C2-C6 alkynyl, substituted C1-C6 alkyl, substituted C2-C6 alkenyl, substituted C2-C6 alkynyl or substituted acyl (C(=O)-). qg and qh are each, independently, H, halogen, C1-C12 alkyl or substituted C1-C12 alkyl. The synthesis and preparation of the methyleneoxy (4'-CH2-O-2') BNA monomers adenine, cytosine, guanine, 5-methyl-cytosine, thymine and uracil, along with their oligomerization, and nucleic acid recognition properties have been described (Koshkin et al., Tetrahedron, 1998, 54, 3607-3630). BNAs and preparation thereof are also described in WO 98/39352 and WO 99/14226 . Analogs of methyleneoxy (4'-CH2-O-2') BNA and 2'-thio-BNAs, have also been prepared (Kumar et al., Bioorg. Med. Chem. Lett., 1998, 8, 2219-2222). Preparation of locked nucleoside analogs comprising oligodeoxyribonucleotide duplexes as substrates for nucleic acid polymerases has also been described ( Wengel et al., WO 99/14226 ). Furthermore, synthesis of 2'-amino-BNA, a novel comformationally restricted high-affinity oligonucleotide analog has been described in the art (Singh et al., J. Org. Chem., 1998, 63, 10035-10039). In addition, 2'-amino- and 2'-methylamino-BNA's have been prepared and the thermal stability of their duplexes with complementary RNA and DNA strands has been previously reported. qi and qj or ql and qk together are =C(qg)(qh), wherein qg and qh are each, independently, H, halogen, C1-C12 alkyl or substituted C1-C12 alkyl. One carbocyclic bicyclic nucleoside having a 4'-(CH2)3-2' bridge and the alkenyl analog bridge 4'-CH=CH-CH2-2' have been described (Freier et al., Nucleic Acids Research, 1997, 25(22), 4429-4443 and Albaek et al., J. Org. Chem., 2006, 71, 7731-7740). The synthesis and preparation of carbocyclic bicyclic nucleosides along with their oligomerization and biochemical studies have also been described (Srivastava et al., J. Am. Chem. Soc., 2007, 129(26), 8362-8379). As used herein, "4'-2' bicyclic nucleoside" or "4' to 2' bicyclic nucleoside" refers to a bicyclic nucleoside comprising a furanose ring comprising a bridge connecting two carbon atoms of the furanose ring connects the 2' carbon atom and the 4' carbon atom of the sugar ring. As used herein, "monocylic nucleosides" refer to nucleosides comprising modified sugar moieties that are not bicyclic sugar moieties. In certain embodiments, the sugar moiety, or sugar moiety analogue, of a nucleoside may be modified or substituted at any position. As used herein, "2'-modified sugar" means a furanosyl sugar modified at the 2' position. In certain embodiments, such modifications include substituents selected from: a halide, including, but not limited to substituted and unsubstituted alkoxy, substituted and unsubstituted thioalkyl, substituted and unsubstituted amino alkyl, substituted and unsubstituted alkyl, substituted and unsubstituted allyl, and substituted and unsubstituted alkynyl. In certain embodiments, 2' modifications are selected from substituents including, but not limited to: O[(CH2)nO]mCH3, O(CH2)nNH2, O(CH2)nCH3, O(CH2)nF, O(CH2)nONH2, OCH2C(=O)N(H)CH3, and O(CH2)nON[(CH2)nCH3]2, where n and m are from 1 to about 10. Other 2'- substituent groups can also be selected from: C1-C12 alkyl, substituted alkyl, alkenyl, alkynyl, alkaryl, aralkyl, O-alkaryl or O-aralkyl, SH, SCH3, OCN, Cl, Br, CN, F, CF3, OCF3, SOCH3, SO2CH3, ONO2, NO2, N3, NH2, heterocycloalkyl, heterocycloalkaryl, aminoalkylamino, polyalkylamino, substituted silyl, an RNA cleaving group, a reporter group, an intercalator, a group for improving pharmacokinetic properties, or a group for improving the pharmacodynamic properties of an antisense compound, and other substituents having similar properties. In certain embodiments, modifed nucleosides comprise a 2'-MOE side chain (Baker et al., J. Biol. Chem., 1997, 272, 11944-12000). Such 2'-MOE substitution have been described as having improved binding affinity compared to unmodified nucleosides and to other modified nucleosides, such as 2'-O-methyl, O-propyl, and O-aminopropyl. Oligonucleotides having the 2'-MOE substituent also have been shown to be antisense inhibitors of gene expression with promising features for in vivo use (Martin, Helv. Chim. Acta, 1995, 78, 486-504; Altmann et al., Chimia, 1996, 50, 168-176; Altmann et al., Biochem. Soc. 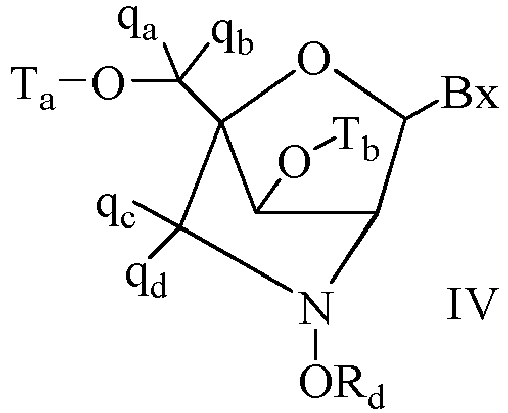 Trans., 1996, 24, 630-637; and Altmann et al., Nucleosides Nucleotides, 1997, 16, 917-926). q1, q2, q3, q4, q5, q6 and q7 are each independently, H, C1-C6 alkyl, substituted C1-C6 alkyl, C2-C6 alkenyl, substituted C2-C6 alkenyl, C2-C6 alkynyl or substituted C2-C6 alkynyl; and each of R1 and R2 is selected from hydrogen, hydroxyl, halogen, subsitituted or unsubstituted alkoxy, NJ1J2, SJ1, N3, OC(=X)J1, OC(=X)NJ1J2, NJ3C(=X)NJ1J2 and CN, wherein X is O, S or NJ1 and each J1, J2 and J3 is, independently, H or C1-C6 alkyl. 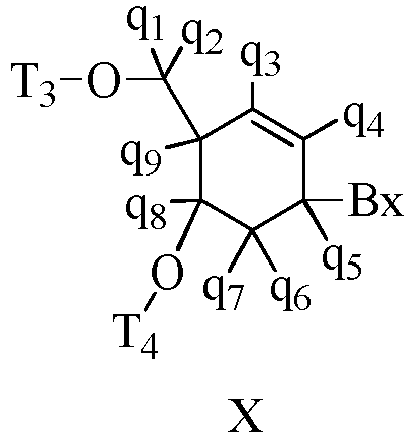 In certain embodiments, the modified THP nucleosides of Formula VII are provided wherein q1, q2, q3, q4, q5, q6 and q7 are each H. In certain embodiments, at least one of q1, q2, q3, q4, q5, q6 and q7 is other than H. In certain embodiments, at least one of q1, q2, q3, q4, q5, q6 and q7 is methyl. In certain embodiments, THP nucleosides of Formula VII are provided wherein one of R1 and R2 is fluoro. In certain embodiments, R1 is fluoro and R2 is H; R1 is methoxy and R2 is H, and R1 is H and R2 is methoxyethoxy. In certain embodiments, morpholinos may be modified, for example by adding or altering various substituent groups from the above morpholino structure. Such sugar surrogates are referred to herein as "modifed morpholinos." Combinations of modifications are also provided without limitation, such as 2'-F-5'-methyl substituted nucleosides (see PCT International Application WO 2008/101157 published on 8/21/08 for other disclosed 5', 2'-bis substituted nucleosides) and replacement of the ribosyl ring oxygen atom with S and further substitution at the 2'-position (see published U.S. Patent Application US2005-0130923, published on June 16, 2005 ) or alternatively 5'-substitution of a bicyclic nucleic acid (see PCT International Application WO 2007/134181 , published on 11/22/07 wherein a 4'-CH2-O-2' bicyclic nucleoside is further substituted at the 5' position with a 5'-methyl or a 5'-vinyl group). The synthesis and preparation of carbocyclic bicyclic nucleosides along with their oligomerization and biochemical studies have also been described (see, e.g., Srivastava et al., J. Am. Chem. Soc. 2007, 129(26), 8362-8379). In certain embodiments, antisense compounds comprise one or more modified cyclohexenyl nucleosides, which is a nucleoside having a six-membered cyclohexenyl in place of the pentofuranosyl residue in naturally occurring nucleosides. Modified cyclohexenyl nucleosides include, but are not limited to those described in the art (see for example commonly owned, published PCT Application WO 2010/036696, published on April 10, 2010 , Robeyns et al., J. Am. Chem. Soc., 2008, 130(6), 1979-1984; Horváth et al., Tetrahedron Letters, 2007, 48, 3621-3623; Nauwelaerts et al., J. Am. Chem. Soc., 2007, 129(30), 9340-9348; Gu et al.,, Nucleosides, Nucleotides & Nucleic Acids, 2005, 24(5-7), 993-998; Nauwelaerts et al., Nucleic Acids Research, 2005, 33(8), 2452-2463; Robeyns et al., Acta Crystallographica, Section F: Structural Biology and Crystallization Communications, 2005, F61(6), 585-586; Gu et al., Tetrahedron, 2004, 60(9), 2111-2123; Gu et al., Oligonucleotides, 2003, 13(6), 479-489; Wang et al., J. Org. Chem., 2003, 68, 4499-4505; Verbeure et al., Nucleic Acids Research, 2001, 29(24), 4941-4947; Wang et al., J. Org. Chem., 2001, 66, 8478-82; Wang et al., Nucleosides, Nucleotides & Nucleic Acids, 2001, 20(4-7), 785-788; Wang et al., J. Am. Chem., 2000, 122, 8595-8602; Published PCT application, WO 06/047842 ; and Published PCT Application WO 01/049687 ). Certain modified cyclohexenyl nucleosides have Formula X.
q1, q2, q3, q4, q5, q6, q7, q8 and q9 are each, independently, H, C1-C6 alkyl, substituted C1-C6 alkyl, C2-C6 alkenyl, substituted C2-C6 alkenyl, C2-C6 alkynyl, substituted C2-C6 alkynyl or other sugar substituent group. As used herein, "2'-modified" or "2'-substituted" refers to a nucleoside comprising a sugar comprising a substituent at the 2' position other than H or OH. 2'-modified nucleosides, include, but are not limited to, bicyclic nucleosides wherein the bridge connecting two carbon atoms of the sugar ring connects the 2' carbon and another carbon of the sugar ring; and nucleosides with non-bridging 2'substituents, such as allyl, amino, azido, thio, O-allyl, O-C1-C10 alkyl, -OCF3, O-(CH2)2-O-CH3, 2'-O(CH2)2SCH3, O-(CH2)2-O-N(Rm)(Rn), or O-CH2-C(=O)-N(Rm)(Rn), where each Rm and Rn is, independently, H or substituted or unsubstituted C1-C10 alkyl. 2'-modifed nucleosides may further comprise other modifications, for example at other positions of the sugar and/or at the nucleobase. 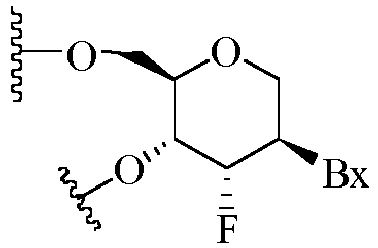 As used herein, "2'-F" refers to a nucleoside comprising a sugar comprising a fluoro group at the 2' position of the sugar ring. As used herein, "2'-OMe" or "2'-OCH3" or "2'-O-methyl" each refers to a nucleoside comprising a sugar comprising an -OCH3 group at the 2' position of the sugar ring. As used herein, "MOE" or "2'-MOE" or "2'-OCH2CH2OCH3" or "2'-O-methoxyethyl" each refers to a nucleoside comprising a sugar comprising a -OCH2CH2OCH3 group at the 2' position of the sugar ring. As used herein, "oligonucleotide" refers to a compound comprising a plurality of linked nucleosides. In certain embodiments, one or more of the plurality of nucleosides is modified. In certain embodiments, an oligonucleotide comprises one or more ribonucleosides (RNA) and/or deoxyribonucleosides (DNA). Many other bicyclo and tricyclo sugar surrogate ring systems are also known in the art that can be used to modify nucleosides for incorporation into antisense compounds (see for example review article: Leumann, Bioorg. Med. Chem., 2002, 10, 841-854). Such ring systems can undergo various additional substitutions to enhance activity. Methods for the preparations of modified sugars are well known to those skilled in the art. Some representative U.S. patents that teach the preparation of such modified sugars include without limitation, U.S.: 4,981,957 ; 5,118,800 ; 5,319,080 ; 5,359,044 ; 5,393,878 ; 5,446,137 ; 5,466,786 ; 5,514,785 ; 5,519,134 ; 5,567,811 ; 5,576,427 ; 5,591,722 ; 5,597,909 ; 5,610,300 ; 5,627,053 ; 5,639,873 ; 5,646,265 ; 5,670,633 ; 5,700,920 ; 5,792,847 and 6,600,032 and International Application PCT/US2005/019219, filed June 2, 2005 and published as WO 2005/121371 on December 22, 2005 . In nucleotides having modified sugar moieties, the nucleobase moieties (natural, modified or a combination thereof) are maintained for hybridization with an appropriate nucleic acid target. In certain embodiments, antisense compounds comprise one or more nucleosides having modified sugar moieties. In certain embodiments, the modified sugar moiety is 2'-MOE. In certain embodiments, the 2'-MOE modified nucleosides are arranged in a gapmer motif. In certain embodiments, the modified sugar moiety is a bicyclic nucleoside having a (4'-CH(CH3)-O-2') bridging group. In certain embodiments, the (4'-CH(CH3)-O-2') modified nucleosides are arranged throughout the wings of a gapmer motif. Nucleobase (or base) modifications or substitutions are structurally distinguishable from, yet functionally interchangeable with, naturally occurring or synthetic unmodified nucleobases. Both natural and modified nucleobases are capable of participating in hydrogen bonding. Such nucleobase modifications may impart nuclease stability, binding affinity or some other beneficial biological property to antisense compounds. Modified nucleobases include synthetic and natural nucleobases such as, for example, 5-methylcytosine (5-me-C). Certain nucleobase substitutions, including 5-methylcytosine substitutions, are particularly useful for increasing the binding affinity of an antisense compound for a target nucleic acid. For example, 5-methylcytosine substitutions have been shown to increase nucleic acid duplex stability by 0.6-1.2°C (Sanghvi, Y.S., Crooke, S.T. and Lebleu, B., eds., Antisense Research and Applications, CRC Press, Boca Raton, 1993, pp. 276-278). Additional modified nucleobases include 5-hydroxymethyl cytosine, xanthine, hypoxanthine, 2-aminoadenine, 6-methyl and other alkyl derivatives of adenine and guanine, 2-propyl and other alkyl derivatives of adenine and guanine, 2-thiouracil, 2-thiothymine and 2-thiocytosine, 5-halouracil and cytosine, 5-propynyl (-C≡C-CH3) uracil and cytosine and other alkynyl derivatives of pyrimidine bases, 6-azo uracil, cytosine and thymine, 5-uracil (pseudouracil), 4-thiouracil, 8-halo, 8-amino, 8-thiol, 8-thioalkyl, 8-hydroxyl and other 8-substituted adenines and guanines, 5-halo particularly 5-bromo, 5-trifluoromethyl and other 5-substituted uracils and cytosines, 7-methylguanine and 7-methyladenine, 2-F-adenine, 2-amino-adenine, 8-azaguanine and 8-azaadenine, 7-deazaguanine and 7-deazaadenine and 3-deazaguanine and 3-deazaadenine. Heterocyclic base moieties may also include those in which the purine or pyrimidine base is replaced with other heterocycles, for example 7-deaza-adenine, 7-deazaguanosine, 2-aminopyridine and 2-pyridone. Nucleobases that are particularly useful for increasing the binding affinity of antisense compounds include 5-substituted pyrimidines, 6-azapyrimidines and N-2, N-6 and 0-6 substituted purines, including 2 aminopropyladenine, 5-propynyluracil and 5-propynylcytosine. In certain embodiments, antisense compounds targeted to a Factor VII nucleic acid comprise one or more modified nucleobases. In certain embodiments, gap-widened antisense oligonucleotides targeted to a Factor VII nucleic acid comprise one or more modified nucleobases. In certain embodiments, the modified nucleobase is 5-methylcytosine. In certain embodiments, each cytosine is a 5-methylcytosine. Antisense oligonucleotides may be admixed with pharmaceutically acceptable active or inert substances for the preparation of pharmaceutical compositions or formulations. Compositions and methods for the formulation of pharmaceutical compositions are dependent upon a number of criteria, including, but not limited to, route of administration, extent of disease, or dose to be administered. An antisense compound targeted to a kallikrein nucleic acid can be utilized in pharmaceutical compositions by combining the antisense compound with a suitable pharmaceutically acceptable diluent or carrier. A pharmaceutically acceptable diluent includes phosphate-buffered saline (PBS). PBS is a diluent suitable for use in compositions to be delivered parenterally. Accordingly, in one embodiment, employed in the methods described herein is a pharmaceutical composition comprising an antisense compound targeted to a kallikrein nucleic acid and a pharmaceutically acceptable diluent. In certain embodiments, the pharmaceutically acceptable diluent is PBS. In certain embodiments, the antisense compound is an antisense oligonucleotide. Pharmaceutical compositions comprising antisense compounds encompass any pharmaceutically acceptable salts, esters, or salts of such esters, or any other oligonucleotide which, upon administration to an animal, including a human, is capable of providing (directly or indirectly) the biologically active metabolite or residue thereof. Accordingly, for example, the disclosure is also drawn to pharmaceutically acceptable salts of antisense compounds, prodrugs, pharmaceutically acceptable salts of such prodrugs, and other bioequivalents. Suitable pharmaceutically acceptable salts include, but are not limited to, sodium and potassium salts. In certain embodiments, one or more modified oligonucleotides of the present invention can be formulated as a prodrug. A prodrug can be produced by modifying a pharmaceutically active compound such that the active compound will be regenerated upon in vivo administration. For example, a prodrug can include the incorporation of additional nucleosides at one or both ends of an antisense compound which are cleaved by endogenous nucleases within the body, to form the active antisense compound. Antisense compounds may be covalently linked to one or more moieties or conjugates which enhance the activity, cellular distribution or cellular uptake of the resulting antisense oligonucleotides. Typical conjugate groups include cholesterol moieties and lipid moieties. Additional conjugate groups include carbohydrates, phospholipids, biotin, phenazine, folate, phenanthridine, anthraquinone, acridine, fluoresceins, rhodamines, coumarins, and dyes. Antisense compounds can also be modified to have one or more stabilizing groups that are generally attached to one or both termini of antisense compounds to enhance properties such as, for example, nuclease stability. Included in stabilizing groups are cap structures. These terminal modifications protect the antisense compound having terminal nucleic acid from exonuclease degradation, and can help in delivery and/or localization within a cell. The cap can be present at the 5'-terminus (5'-cap), or at the 3'-terminus (3'-cap), or can be present on both termini. Cap structures are well known in the art and include, for example, inverted deoxy abasic caps. Further 3' and 5'-stabilizing groups that can be used to cap one or both ends of an antisense compound to impart nuclease stability include those disclosed in WO 03/004602 published on January 16, 2003 . The effects of antisense compounds on the level, activity or expression of kiallikrein nucleic acids can be tested in vitro in a variety of cell types. Cell types used for such analyses are available from commerical vendors (e.g. American Type Culture Collection, Manassus, VA; Zen-Bio, Inc., Research Triangle Park, NC; Clonetics Corporation, Walkersville, MD) and are cultured according to the vendor's instructions using commercially available reagents (e.g. Invitrogen Life Technologies, Carlsbad, CA). Illustrative cell types include, but are not limited to, HepG2 cells, Hep3B cells, and primary hepatocytes. Described herein are methods for treatment of cells with antisense oligonucleotides, which can be modified appropriately for treatment with other antisense compounds. In general, cells are treated with antisense oligonucleotides when the cells reach approximately 60-80% confluency in culture. One reagent commonly used to introduce antisense oligonucleotides into cultured cells includes the cationic lipid transfection reagent LIPOFECTIN (Invitrogen, Carlsbad, CA). Antisense oligonucleotides are mixed with LIPOFECTIN in OPTI-MEM 1 (Invitrogen, Carlsbad, CA) to achieve the desired final concentration of antisense oligonucleotide and a LIPOFECTIN concentration that typically ranges 2 to 12 ug/mL per 100 nM antisense oligonucleotide. Another reagent used to introduce antisense oligonucleotides into cultured cells includes LIPOFECTAMINE (Invitrogen, Carlsbad, CA). Antisense oligonucleotide is mixed with LIPOFECTAMINE in OPTI-MEM 1 reduced serum medium (Invitrogen, Carlsbad, CA) to achieve the desired concentration of antisense oligonucleotide and a LIPOFECTAMINE concentration that typically ranges 2 to 12 ug/mL per 100 nM antisense oligonucleotide. Another technique used to introduce antisense oligonucleotides into cultured cells includes electroporation. Cells are treated with antisense oligonucleotides by routine methods. Cells are typically harvested 16-24 hours after antisense oligonucleotide treatment, at which time RNA or protein levels of target nucleic acids are measured by methods known in the art and described herein. In general, when treatments are performed in multiple replicates, the data are presented as the average of the replicate treatments. The concentration of antisense oligonucleotide used varies from cell line to cell line. Methods to determine the optimal antisense oligonucleotide concentration for a particular cell line are well known in the art. Antisense oligonucleotides are typically used at concentrations ranging from 1 nM to 300 nM when transfected with LIPOFECTAMINE. Antisense oligonucleotides are used at higher concentrations ranging from 625 to 20,000 nM when transfected using electroporation. RNA analysis can be performed on total cellular RNA or poly(A)+ mRNA. Methods of RNA isolation are well known in the art. RNA is prepared using methods well known in the art, for example, using the TRIZOL Reagent (Invitrogen, Carlsbad, CA) according to the manufacturer's recommended protocols. Inhibition of levels or expression of a kallikrein nucleic acid can be assayed in a variety of ways known in the art. For example, target nucleic acid levels can be quantitated by, e.g., Northern blot analysis, competitive polymerase chain reaction (PCR), or quantitaive real-time PCR. RNA analysis can be performed on total cellular RNA or poly(A)+ mRNA. Methods of RNA isolation are well known in the art. Northern blot analysis is also routine in the art. Quantitative real-time PCR can be conveniently accomplished using the commercially available ABI PRISM 7600, 7700, or 7900 Sequence Detection System, available from PE-Applied Biosystems, Foster City, CA and used according to manufacturer's instructions. Quantitation of target RNA levels may be accomplished by quantitative real-time PCR using the ABI PRISM 7600, 7700, or 7900 Sequence Detection System (PE-Applied Biosystems, Foster City, CA) according to manufacturer's instructions. Methods of quantitative real-time PCR are well known in the art. Prior to real-time PCR, the isolated RNA is subjected to a reverse transcriptase (RT) reaction, which produces complementary DNA (cDNA) that is then used as the substrate for the real-time PCR amplification. The RT and real-time PCR reactions are performed sequentially in the same sample well. RT and real-time PCR reagents are obtained from Invitrogen (Carlsbad, CA). RT real-time-PCR reactions are carried out by methods well known to those skilled in the art. Gene (or RNA) target quantities obtained by real time PCR are normalized using either the expression level of a gene whose expression is constant, such as cyclophilin A, or by quantifying total RNA using RIBOGREEN (Invitrogen, Inc. Carlsbad, CA). Cyclophilin A expression is quantified by real time PCR, by being run simultaneously with the target, multiplexing, or separately. Total RNA is quantified using RIBOGREEN RNA quantification reagent (Invetrogen, Inc. Eugene, OR). Methods of RNA quantification by RIBOGREEN are taught in Jones, L.J., et al, (Analytical Biochemistry, 1998, 265, 368-374). A CYTOFLUOR 4000 instrument (PE Applied Biosystems) is used to measure RIBOGREEN fluorescence. Probes and primers are designed to hybridize to a Kallikrein nucleic acid. Methods for designing real-time PCR probes and primers are well known in the art, and may include the use of software such as PRIMER EXPRESS Software (Applied Biosystems, Foster City, CA). Antisense inhibition of kallikrein nucleic acids can be assessed by measuring kallikrein protein levels. Protein levels of kallikrein can be evaluated or quantitated in a variety of ways well known in the art, such as immunoprecipitation, Western blot analysis (immunoblotting), enzyme-linked immunosorbent assay (ELISA), quantitative protein assays, protein activity assays (for example, caspase activity assays), immunohistochemistry, immunocytochemistry or fluorescence-activated cell sorting (FACS). Antibodies directed to a target can be identified and obtained from a variety of sources, such as the MSRS catalog of antibodies (Aerie Corporation, Birmingham, MI), or can be prepared via conventional monoclonal or polyclonal antibody generation methods well known in the art. Antibodies useful for the detection of mouse, rat, monkey, and human kallikrein are commercially available. Antisense compounds, for example, antisense oligonucleotides, are tested in animals to assess their ability to inhibit expression of kallikrein and produce phenotypic changes, such as, prolonged aPTT, prolonged aPTT time in conjunction with a normal PT, decreased quantity of Platelet Factor 4 (PF-4), and reduced formation of thrombus or increased time for thrombus formation. Testing may be performed in normal animals, or in experimental disease models. For administration to animals, antisense oligonucleotides are formulated in a pharmaceutically acceptable diluent, such as phosphate-buffered saline. Administration includes parenteral routes of administration, such as intraperitoneal, intravenous, and subcutaneous. Calculation of antisense oligonucleotide dosage and dosing frequency is within the abilities of those skilled in the art, and depends upon factors such as route of administration and animal body weight. Following a period of treatment with antisense oligonucleotides, RNA is isolated from liver tissue and changes in kallikrein nucleic acid expression are measured. Changes in kallikrein protein levels are also measured using a thrombin generation assay. In addition, effects on clot times, e.g. PT and aPTT, are determined using plasma from treated animals. Methods of treating an individual comprising administering one or more pharmaceutical compositions as decribed herein are disclosed herein. In certain embodiments of the disclosure, the individual has a thromboembolic condition. In certain embodiments of the disclosure, the individual is at risk for a blood clotting disorder, including, but not limited to, infarct, thrombosis, embolism, thromboembolism such as deep vein thrombosis, pulmonary embolism, myocardial infarction, and stroke. This includes individuals with an acquired problem, disease, or disorder that leads to a risk of thrombosis, for example, surgery, cancer, immobility, sepsis, atherosclerosis atrial fibrillation, as well as genetic predisposition, for example, antiphospholipid syndrome and the autosomal dominant condition, Factor V Leiden. In certain embodiments of the disclosure, the individual has been identified as in need of anticoagulation therapy. Examples of such individuals include, but are not limited to, those undergoing major orthopedic surgery (e.g., hip/knee replacement or hip fracture surgery) and patients in need of chronic treatment, such as those suffering from arterial fibrillation to prevent stroke. Methods for prophylactically reducing kallikrein expression in an individual are also disclosed herein. Certain embodiments of the invention include treating an individual in need thereof by administering to an individual a therapeutically effective amount of an antisense compound for use according to the invention targeted to a kallikrein nucleic acid. In one embodiment of the invention, administration of a therapeutically effective amount of an antisense compound for use according to the invention targeted to a kallikrein nucleic acid is accompanied by monitoring of kallikrein levels in the serum of an individual, to determine an individual's response to administration of the antisense compound. An individual's response to administration of the antisense compound is used by a physician to determine the amount and duration of therapeutic intervention. In certain embodiments of the invention, administration of an antisense compound for use according to the invention targeted to a kallikrein nucleic acid results in reduction of kallikrein expression by at least 15, 20, 25, 30, 35, 40, 45, 50, 55, 60, 65, 70, 75, 80, 85, 90, 95 or 99%, or a range defined by any two of these values. In certain embodiments of the invention, administration of an antisense compound for use according to the invention targeted to a kallikrein nucleic acid results in a change in a measure of blood clotting as measured by a standard test, for example, but not limited to, activated partial thromboplastin time (aPTT) test, prothrombin time (PT) test, thrombin time (TCT), bleeding time, or D-dimer. In certain embodiments of the invention, administration of a kallikrein antisense compound for use according to the invention increases the measure by at least 15, 20, 25, 30, 35, 40, 45, 50, 55, 60, 65, 70, 75, 80, 85, 90, 95 or 99%, or a range defined by any two of these values. In some embodiments of the invention, administration of a kallikrein antisense compound for use according to the invention decreases the measure by at least 15, 20, 25, 30, 35, 40, 45, 50, 55, 60, 65, 70, 75, 80, 85, 90, 95 or 99%, or a range defined by any two of these values. In certain embodiments, pharmaceutical compositions comprising an antisense compound for use according to the invention targeted to kallikrein are used for the preparation of a medicament for treating a patient suffering or susceptible to a thromboembolic condition. In certain embodiments of the invention, one or more pharmaceutical compositions comprising an antisense compound for use according to the invention are co-administered with one or more other pharmaceutical agents. In certain embodiments of the invention, such one or more other pharmaceutical agents are designed to treat the same disease, disorder, or condition as the one or more pharmaceutical compositions comprising an antisense compound for use according to the invention. In certain embodiments of the invention, such one or more other pharmaceutical agents are designed to treat a different disease, disorder, or condition as the one or more pharmaceutical compositions comprising an antisense compound for use according to the invention. In certain embodiments of the invention, such one or more other pharmaceutical agents are designed to treat an undesired side effect of one or more pharmaceutical compositions comprising an antisense compound for use according to the invention. In certain embodiments of the invention, one or more pharmaceutical compositions comprising an antisense compound for use according to the invention are co-administered with another pharmaceutical agent to treat an undesired effect of that other pharmaceutical agent. In certain embodiments of the invention, one or more pharmaceutical compositions comprising an antisense compound for use according to the invention are co-administered with another pharmaceutical agent to produce a combinational effect. In certain embodiments of the invention, one or more pharmaceutical compositions comprising an antisense compound for use according to the invention are co-administered with another pharmaceutical agent to produce a synergistic effect. In certain embodiments of the invention, one or more pharmaceutical compositions comprising an antisense compound for use according to the invention and one or more other pharmaceutical agents are administered at the same time. In certain embodiments of the invention, one or more pharmaceutical compositions comprising an antisense compound for use according to the invention and one or more other pharmaceutical agents are administered at different times. In certain embodiments of the invention, one or more pharmaceutical compositions comprising an antisense compound for use according to the invention and one or more other pharmaceutical agents are prepared together in a single formulation. In certain embodiments of the invention, one or more pharmaceutical compositions comprising an antisense compound for use according to the invention and one or more other pharmaceutical agents are prepared separately. In certain embodiments of the invention, pharmaceutical agents that may be co-administered with a pharmaceutical composition comprising an antisense compound for use according to the invention include anticoagulant or antiplatelet agents. In certain embodiments of the invention, pharmaceutical agents that may be co-administered with a pharmaceutical composition comprising an antisense compound for use according to the invention include NSAID/Cyclooxygenase inhibitors, such as, aspirin. In certain embodiments of the invention, pharmaceutical agents that may be co-administered with a pharmaceutical composition comprising an antisense compound for use according to the invention include adenosine diphosphate (ADP) receptor inhibitors, such as, clopidogrel (PLAVIX) and ticlopidine (TICLID). In certain embodiments of the invention, pharmaceutical agents that may be co-administered with a pharmaceutical composition comprising an antisense compound for use according to the invention include phosphodiesterase inhibitors, such as, cilostazol (PLETAL). In certain embodiments of the invention, pharmaceutical agents that may be co-administered with a pharmaceutical composition comprising an antisense compound for use according to the invention include, glycoprotein IIB/IIIA inhibitors, such as, abciximab (REOPRO), eptifibatide (INTEGRILIN), tirofiban (AGGRASTAT), and defibrotide. In certain embodiments of the invention, pharmaceutical agents that may be co-administered with a pharmaceutical composition comprising an antisense compound for use according to the invention include, adenosine reuptake inhibitors, such as, to dipyridamole (PERSANTINE). In certain embodiments of the invention, pharmaceutical agents that may be co-administered with a pharmaceutical composition comprising an antisense compound for use according to the invention include, but are not limited to warfarin (and related coumarins), heparin, direct thrombin inhibitors (such as lepirudin, bivalirudin), apixaban, LOVENOX, and small molecular compounds that interfere directly with the enzymatic action of particular coagulation factors (e.g. rivaroxaban, which interferes with Factor Xa). In certain embodiments of the invention, pharmaceutical agents that may be co-administered with an antisense compound for use according to the invention include, but are not limited to, an additional kallikrein inhibitor. In certain embodiments of the invention, the anticoagulant or antiplatelet agent is administered prior to administration of a pharmaceutical composition comprising an antisense compound for use according to the invention. In certain embodiments of the invention, the anticoagulant or antiplatelet agent is administered following administration of a pharmaceutical composition comprising an antisense compound for use according to the invention. In certain embodiments of the invention the anticoagulant or antiplatelet agent is administered at the same time as a pharmaceutical composition comprising an antisense compound for use according to the invention. In certain embodiments of the invention the dose of a co-administered anticoagulant or antiplatelet agent is the same as the dose that would be administered if the anticoagulant or antiplatelet agent was administered alone. In certain embodiments of the invention the dose of a co-administered anticoagulant or antiplatelet agent is lower than the dose that would be administered if the anticoagulant or antiplatelet agent was administered alone. In certain embodiments of the invention the dose of a co-administered anticoagulant or antiplatelet agent is greater than the dose that would be administered if the anticoagulant or antiplatelet agent was administered alone. In certain embodiments of the invention, the co-administration of a second compound enhances the anticoagulant effect of a first compound, such that co-administration of the compounds results in an anticoagulant effect that is greater than the effect of administering the first compound alone. In other embodiments of the invention, the co-administration results in anticoagulant effects that are additive of the effects of the compounds when administered alone. In certain embodiments of the invention, the co-administration results in anticoagulant effects that are supra-additive of the effects of the compounds when administered alone. In certain embodiments of the invention, the co-administration of a second compound increases antithrombotic activity without increased bleeding risk. The first compound is an antisense compound. In certain embodiments of the invention, the second compound is an antisense compound. In certain embodiments of the invention, an antidote is administered anytime after the administration of an antisense compound for use according to the invention. In certain embodiments of the invention, the antidote is administered minutes, hours, days, weeks, or months after the administration of an antisense compound for use according to the invention. In certain embodiments, the antidote is a complementary (e.g. the sense strand) to the antisense compound targeting kallikrein. In certain embodiments, the antidote is a Factor 7 or Factor 7a protein. In certain embodiments, the Factor 7 or Factor 7a protein is a human Factor 7 or human Factor 7a protein. In certain embodiments, the Factor 7 protein is NOVOSEVEN. In certain embodiments of the invention, an antisense compound for use according to the invention is combined with antiplatelet therapies. In certain embodiments of the invention, administration of an antisense compound for use according to the invention in combination with an antiplatelet therapy results in little to no appreciable or detectable increase in risk of bleeding as compared to antiplatelet therapy alone. In certain embodiments of the invention, the risk profile or risk indications are unchanged over antiplatelet therapy alone. The combination of antiplatelet and anticoagulant therapy is used in clinical practice most frequently in patients diagnosed with, for example, thromboembolism, atrial fibrillation, a heart valve disorder, valvular heart disease, stroke, CAD, and in patients having a mechanical valve. The benefit of dual therapy relates to the probable additive effect of suppressing both platelet and coagulation factor activities. The risk of dual therapy is the potential for increased bleeding (Dowd, M. Plenary Sessions/Thrombosis Research 123 (2008)). Prior combinations of antiplatelet and anticoagulant therapy have been shown to increase the risk of bleeding compared with anticoagulant or antiplatelet therapy alone. Such combinations include, FXa inhibitors (e.g., apixiban and rivaroxaban) with ADP receptor/P2Y12 inhibitors (Thienopyridines such as clopidogrel- also known as PLAVIX) and NSAIDs (e.g., aspirin and naproxen) (Kubitza, D. et al., Br. J. Clin. Pharmacol. 63:4 (2006); Wong, P.C. et al. Journal of Thrombosis and Haemostasis 6 (2008); FDA Advisory Committee Briefing Document for New Drug Application 22-406 (2009)). For example, Wong reports that addition of certain doses of apixaban to aspirin and to aspirin plus clopidogrel produced a significant increase in bleeding time compared with aspirin alone and aspirin plus clopidogrel. Kubitza reports that the combination administration of rivaroxaban and naproxen significantly increased bleeding time over naproxen alone. Antisense oligonucleotides targeting a murine kallikrein (KLKB1) nucleic acid were designed and tested for their effects on kallikrein mRNA in vitro. Cultured mouse primary hepatocytes at a density of 10,000 cells per well were transfected using Cytofectin reagent with 12.5 nM, 25.0 nM, 50.0 nM, 100.0 nM, and 200.0 nM of antisense oligonucleotide. After a treatment period of approximately 24 hours, RNA was isolated from the cells and mouse kallikrein mRNA levels were measured by quantitative real-time PCR using the murine primer probe set RTS3313 (forward sequence TGCCTGCTGTTCAGCTTTCTC, designated herein as SEQ ID NO: 20; reverse sequence TGGCAAAGTCCCTGTAATGCT, designated herein as SEQ ID NO: 21; probe sequence CGTGACTCCACCCAAAGAGACAAATAAACG, designated herein as SEQ ID NO: 22). Kallikrein mRNA levels were adjusted according to total RNA content, as measured by RIBOGREEN. The chimeric antisense oligonucleotides were designed as 5-10-5 MOE gapmers. The gapmers are 20 nucleotides in length, wherein the central gap segment is comprised often 2'-deoxynucleosides and is flanked on both sides (in the 5' and 3' directions) by wings comprising 5 nucleosides each. Each nucleoside in the 5' wing segment and each nucleoside in the 3' wing segment has a 2'-MOE modification. The internucleoside linkages throughout each gapmer are phosphorothioate (P=S) linkages. All cytosine residues throughout each gapmer are 5-methylcytosines. Results demonstrate that kallikrein mRNA levels were significantly reduced in a dose dependent manner. ISIS 482584 was also tested for its effect on rat kallikrein (KLKB1) mRNA in vitro. Cultured rat primary hepatocytes at a density of 20,000 cells per well were transfected using Cytofectin reagent with 200 nM of antisense oligonucleotide. After a treatment period of approximately 24 hours, RNA was isolated from the cells and rat kallikrein mRNA levels were measured by quantitative real-time PCR using the murine primer probe set RTS3315 (forward sequence TCGGTTGCCCCATGGAT, designated herein as SEQ ID NO:23; reverse sequence GGTGACGACATGGCTTACATTC, designated herein as SEQ ID NO: 24; probe sequence TTTTCCAGCACTTTGCCTTTGCAGACC, designated herein as SEQ ID NO: 25). Kallikrein mRNA levels were adjusted according to total RNA content, as measured by RIBOGREEN. Results demonstrated that ISIS 482584 reduced kallikrein mRNA in rat primary hepatocytes by 82%. Six groups of male BALB/c mice each were treated with 2.5 mg/kg, 5.0 mg/kg, 10.0 mg/kg, 20.0 mg/kg, 40.0 mg/kg, or 80.0mg/kg of ISIS 482584, administered subcutaneously twice a week for 3 weeks (weekly doses of 5.0 mg/kg, 10.0 mg/kg, 20.0 mg/kg, 40.0 mg/kg, 80.0 mg/kg, or 160.0 mg/kg). A control group of BALB/c mice was treated with PBS, administered subcutaneously twice a week for 3 weeks. Two days after the last dose of antisense oligonucleotide or PBS, mice from all groups were anesthetized with 150 mg/kg ketamine mixed with 10 mg/kg xylazine, administered by intraperitoneal injection. Liver was collected for RNA analysis. ISIS 482584, which demonstrated significant in vitro and in vivo inhibition of kallikrein (KLKB1), was evaluated in the FeCl3-induced inferior vena cava thrombosis mouse model. Three groups of 8 male BALB/c mice were treated with 10 mg/kg, 20 mg/kg, or 40 mg/kg of ISIS 482584, administered subcutaneously twice a week for 3 weeks (weekly doses of 20 mg/kg, 40 mg/kg, or 80 mg/kg). Two control groups of 12 BALB/c mice each were treated with PBS, administered subcutaneously twice a week for 3 weeks. Two days after the last dose of antisense oligonucleotide or PBS, mice from all groups were anesthetized with 150 mg/kg ketamine mixed with 10 mg/kg xylazine, administered by intraperitoneal injection. Thrombus formation was induced with FeCl3 in all groups of anesthetized mice except the first control group. In mice undergoing FeCl3 treatment, thrombus formation was induced by applying a piece of filter paper (2 x 4 mm) pre-saturated with 10 % FeCl3 solution directly on the vena cava. After 3 minutes of exposure, the filter paper was removed. Thirty minutes after the filter paper application, a fixed length of the vein containing the thrombus was dissected out for platelet analysis. Liver was collected for RNA analysis. Tail-bleeding was measured to observe whether treatment with ISIS 482584 causes excess bleeding or hemorrhage in mice. Groups of 10 male BALB/c mice were treated with 10 mg/kg, 20 mg/kg, or 40 mg/kg of ISIS 482584, administered subcutaneously twice a week for 3 weeks (weekly doses of 20 mg/kg, 40 mg/kg, or 80 mg/kg). A control group of 8 BALB/c mice was treated with PBS, administered subcutaneously twice a week for 3 weeks. Two days after the final treatment of ISIS oligonucleotides or PBS, mice were placed in a tail bleeding chamber. Mice were anesthetized in the chamber with isoflurane. Then, a small piece of tail (approximately 4 mm from the tip) was cut with sterile scissors. The cut tail was immediately placed in a 15 mL Falcon tube filled with approximately 10 mL of 0.9 % NaCl buffer solution warmed to 37°C. The blood was collected over the course of 40 minutes. The saline filled tubes were weighed both before and after bleeding. The results are provided in Table 5. ISIS 482584 was evaluated in the FeCl3 induced mesenteric thrombosis mouse model. A group of 6-8 Swiss-Webster mice was treated with 40 mg/kg of ISIS 482584, administered subcutaneously twice a week for 3 weeks (weekly dose of 80 mg/kg). A control group of 6 Swiss-Webster mice was treated with PBS, administered subcutaneously twice a week for 3 weeks. Two days after the last dose of antisense oligonucleotide or PBS, mice from all groups were anesthetized with 75 mg/kg ketamine mixed with 25 mg/kg xylazine, administered by subcutaneous injection. Rhodamine 6G dye at a dosage of 5 mg/kg was injected subcutaneously to stain platelets. Alexa-647-labeled anti-fibrinogen antibody at a dosage of 1 mg/kg was injected via tail vein injection to stain fibrin. The abdomen was opened by a middle incision. The visceral mesentery was spread on a glass coverslip and the mesenteric arterioles (70-120 µm) were located by observation under a microscope. Thrombus formation was induced by applying of cotton threads (2 x 0.3 mm) pre-saturated with 6% FeCl3 solution directly on the target vessel. After three minutes of exposure, the thread was removed and the color intensities of both the dyes were recorded by fluorescent microscopy (Olympus FluoView 1000 confocal laser scanning microscope) with appropriate filters for 70 min. ISIS 482584 was evaluated in the stenosis-induced inferior vena cava (IVC) thrombosis model. Reduced blood flow and endothelial damage are hallmarks of this model, also known as the St. Tomas model. Four groups of 6-8 BALB/c mice were treated with 5 mg/kg, 10 mg/kg, 20 mg/kg, or 40 mg/kg of ISIS 482584, administered subcutaneously twice a week for 3 weeks (weekly doses of 10 mg/kg, 20 mg/kg, 40 mg/kg, or 80 mg/kg). A control group of 8 BALB/c mice was treated with PBS, administered subcutaneously twice a week for 3 weeks. Two days after the last dose of antisense oligonucleotide or PBS was administered, mice from all groups were anesthetized with 2.5% inhalant isoflurane. The IVC of the mice was exposed via a midline abdominal incision below the left renal vein, and was separated from the abdominal aorta by blunt dissection. A 6-0 silk tie (Ethicon, UK) was placed behind the blood vessel just below the left renal vein and a metal 4-0 suture (Ethicon, UK) was placed longitudinally over the IVC to tie the silk tie on top. The metal suture was then removed. Two neurovascular surgical clips (Braun Medical Inc, PA) were placed at two seaparate positions below the ligation for 20 seconds each, after which they were removed. The abdominal cavity contents were then replaced and the abdomen was closed. After 24 hrs, the IVC was exposed and checked for thrombi formation. All thrombi formed were collected and fixed in 10% formalin for 24 hrs. The effect of antisense inhibition ofkallikrein mRNA on Factor 12 protein activation was evaluated. The various treatment groups for this assay are presented in Table 9. Group 1 consisted of 8 mice and was treated with PBS administered subcutaneously twice a week for 3 weeks. No other treatment was administered to Group 1 which served as a control group to measure Factor 12 activation. Groups 2, 3, 4, 5, and 6 consisted of 8 mice each and were treated with 2.5 mg/kg, 5 mg/kg, 10 mg/kg, 20 mg/kg, or 40 mg/kg (corresponding to 5 mg/kg, 10 mg/kg, 20 mg/kg, 40 mg/kg, or 80 mg/kg per week), respectively of ISIS 482584 administered subcutaneously twice a week for 3 weeks. Groups 2-6 served as the treatment groups for measuring the effect of ISIS 482584 on Factor 12 activation. 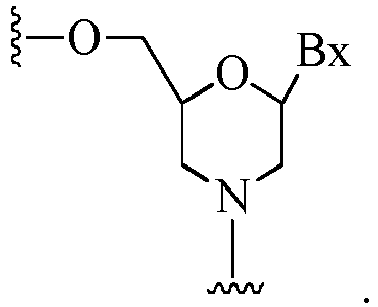 An antisense compound comprising a modified oligonucleotide for use in preventing, treating or ameliorating a thromboembolic condition in an animal, wherein the modified oligonucleotide is at least 90% complementary to a KLKB1 nucleic acid and wherein expression of KLKB1 mRNA is reduced. The antisense compound for use according to claim 1, wherein the animal is a human. The antisense compound for use according to claim 1 or claim 2, wherein the modified oligonucleotide inhibits thrombus and clot formation, and/or prolongs aPTT, and/or does not prolong PT, and/or prolongs aPTT and does not prolong PT, and/or decreases Platelet Factor 4 (PF-4), and/or increases time for thrombus formation, and/or reduces platelet aggregation, and/or reduces fibrin formation. The antisense compound for use according to any of the preceding claims, wherein the thromboembolic condition is any of the group consisting of thrombosis, embolism, thromboembolism, deep vein thrombosis, pulmonary embolism, myocardial infarction, stroke, or a combination thereof. The antisense compound for use according to any of the preceding claims, wherein the use comprises either co-administering or concomitantly administering the modified oligonucleotide and any of the group selected from warfarin, apixaban, LOVENOX, aspirin, clopidogrel, dipyridamole, heparin, lepirudin, ticlopidine, and rivaroxaban, or either co-administering or concomitantly administering the modified oligonucleotide and anti-platelet therapy, wherein optionally the anti-platelet therapy is any of the group selected from an ADP receptor inhibitor, NSAID, phosphodiesterase inhibitor, glycoprotein IIB/IIIA inhibitor, adenosine reuptake inhibitor, or a combination thereof, wherein optionally the NSAID is aspirin, naproxen, or a combination of both. The antisense compound for use according to any of the preceding claims, wherein the modified oligonucleotide consists of 12 to 30 linked nucleosides. The antisense compound for use according to any of the preceding claims, wherein the KLKB1 nucleic acid is a human KLKB1 nucleic acid, and optionally the human KLKB1 nucleic acid is SEQ ID NO: 1, SEQ ID NO: 2, SEQ ID NO: 3, SEQ ID NO: 4, SEQ ID NO: 5, SEQ ID NO: 6, SEQ ID NO: 7, SEQ ID NO: 8, SEQ ID NO: 9, or SEQ ID NO: 10. The antisense compound for use according to any of the preceding claims, wherein the modified oligonucleotide is 100% complementary to a human KLKB1 nucleic acid. The antisense compound for use according to any of the preceding claims, wherein the modified oligonucleotide is a single-stranded oligonucleotide. The antisense compound for use according to any of the preceding claims, wherein the modified oligonucleotide comprises at least one modified internucleoside linkage, wherein optionally the modified internucleoside linkage is a phosphorothioate internucleoside linkage. The antisense compound for use according to any of the preceding claims, wherein the modified oligonucleotide comprises at least one modified sugar. (b) the modified sugar comprises a 2'-O-methoxyethyl group. The antisense compound for use according to any of the preceding claims, wherein at least one nucleoside comprises a modified nucleobase, wherein optionally the modified nucleobase is a 5-methylcytosine. wherein the gap segment is positioned between the 5' wing segment and the 3' wing segment and wherein each nucleoside of each wing segment comprises a modified sugar. wherein the gap segment is positioned between the 5' wing segment and the 3' wing segment, wherein each nucleoside of each wing segment comprises a 2'-O-methoxyethyl sugar; wherein each cytosine in said modified oligonucleotide is a 5-methylcytosine, and wherein each internucleoside linkage of said modified oligonucleotide is a phosphorothioate linkage, and wherein optionally the modified oligonucleotide consists of 20 linked nucleosides. Owner name: IONIS PHARMACEUTICALS, INC.